Difficulty Notes: Dormer is a long day trip, making everything about it slightly harder. 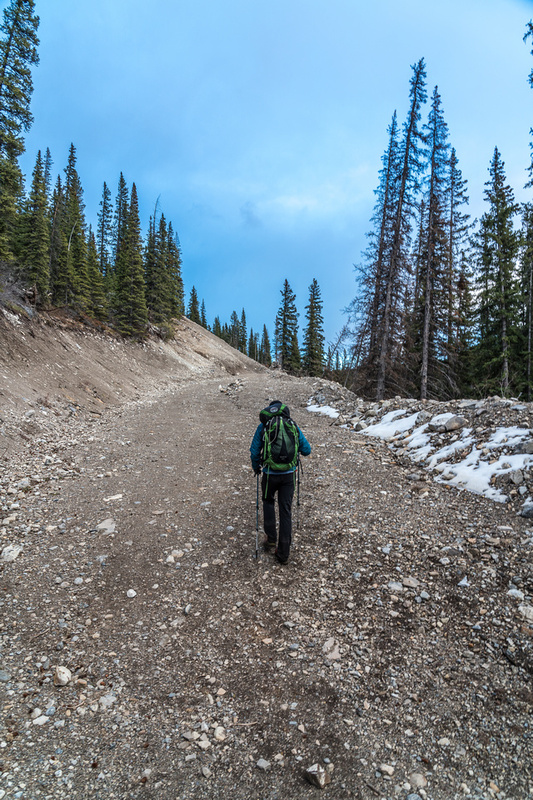 Although you shouldn’t be on more than moderate scrambling terrain, this will require routefinding and perseverance. 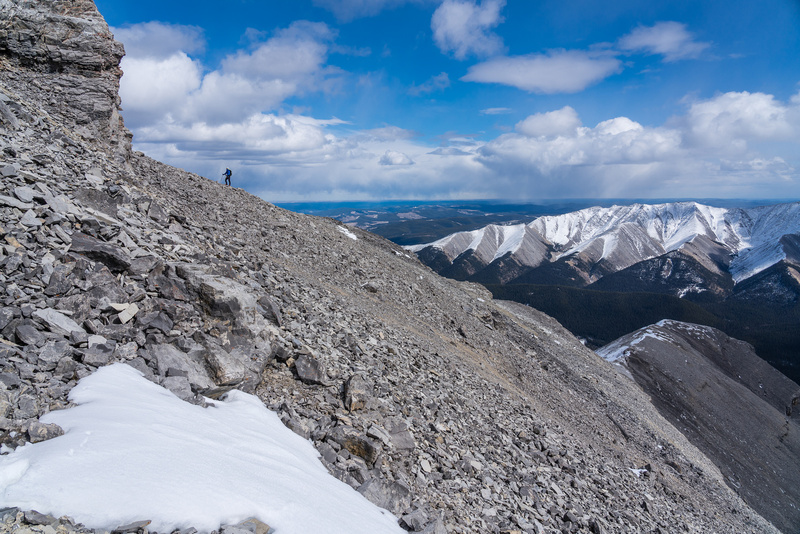 A few weeks ago, on March 23, Phil Richards and I hiked up a snowy Sheep Creek and scrambled Winchester Ridge. 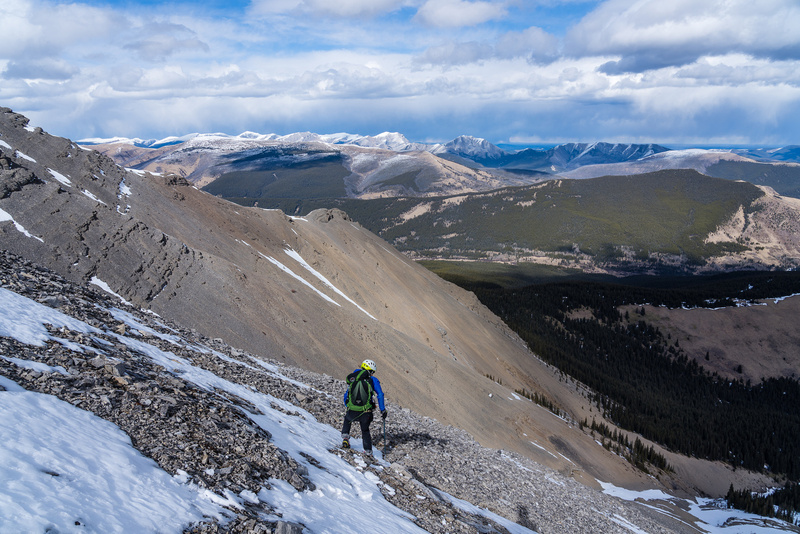 From the ridge we enjoyed spectacular views over the Dormer River towards Dormer Mountain and started to plan what kind of adventure would get us to its summit. Cornelius Rott, had already been up Dormer and just as on Winchester, we would use his trip report as a basis for our own. In some ways I feel like some of the pure adventure factor is missing when I use other people’s trip reports to plan my own, but I also think it’s silly to ignore the fact that someone else has done a lot of legwork for you. Why not use their experiences to elevate your own? So with that in mind we plotted and planned for an early season trek into the Panther and Dormer River valleys. 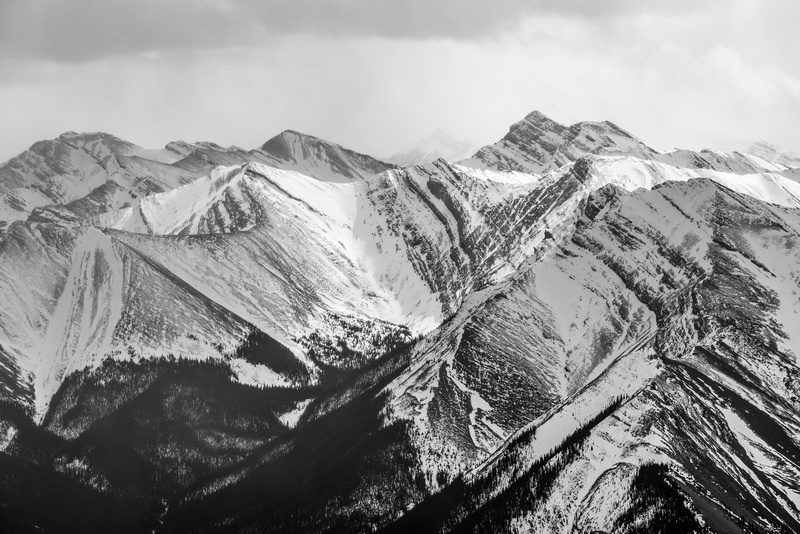 I’ve scouted, planned and schemed many trips into the eastern Alberta Rocky mountains over the years and have started slowly chipping away at the list. It’s a tough area to explore but it’s worth it. 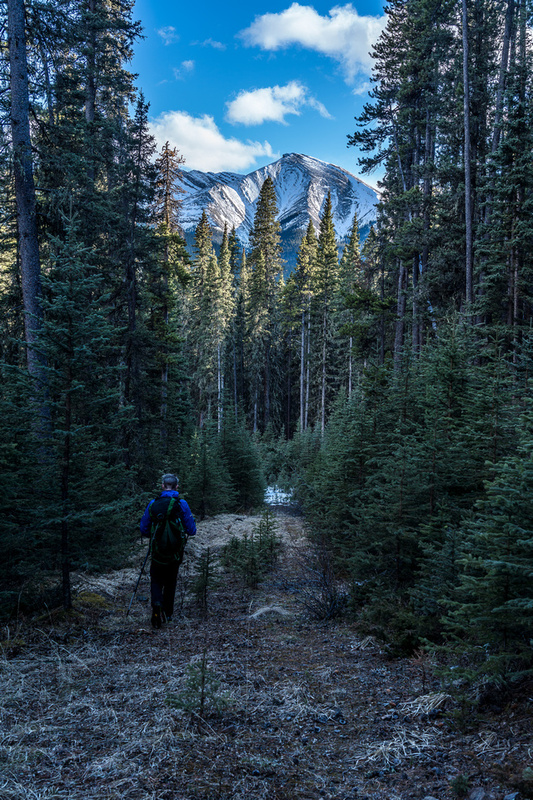 Mount McConnell and Cataract Peak are just two examples of what makes these trips worthwhile if you like adventure. The eastern ranges are surprisingly hard to access and also surprisingly big. 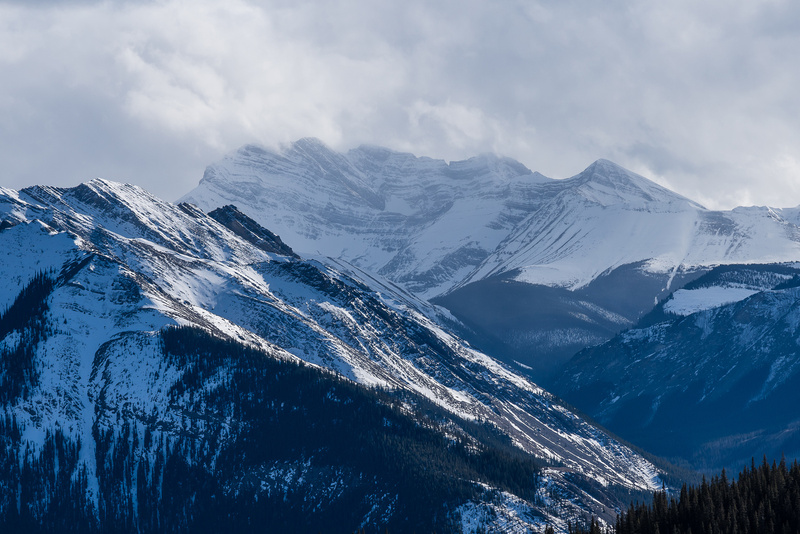 There are many unnamed peaks well over 10,000 feet tucked in between hwy 93 and the Ghost / Waiparous / Tinda areas. But it’s not just the peaks that attract me to this landscape – it’s the landscape as a whole and the feeling it evokes as I trek through it. 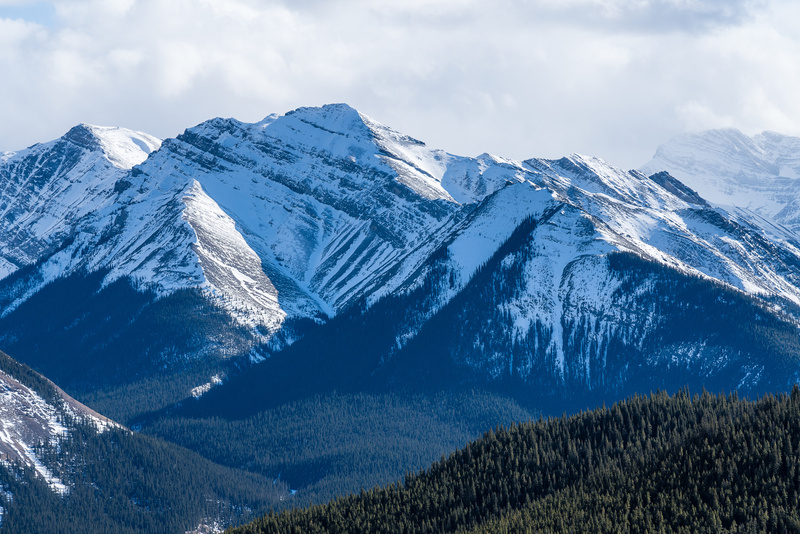 It’s a feeling of an untamed land and just a small hint of what the Rockies must have been like 10,000 years ago when they were truly wild and free of most humans. A surprisingly open valley with an unnamed peak over Phil’s head. 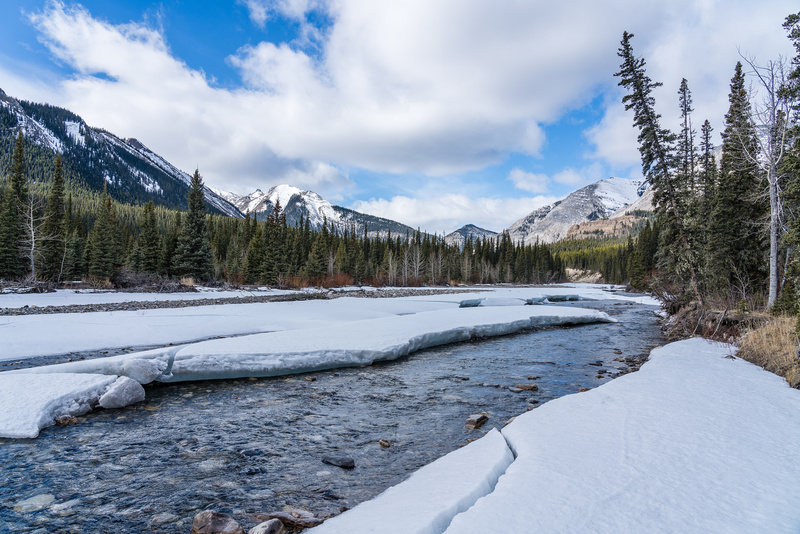 The Red Deer River wanders in several distinct branches through here as it merges with Douglas Creek. Phil crosses Cataract Creek on the 3-boulder bridge. 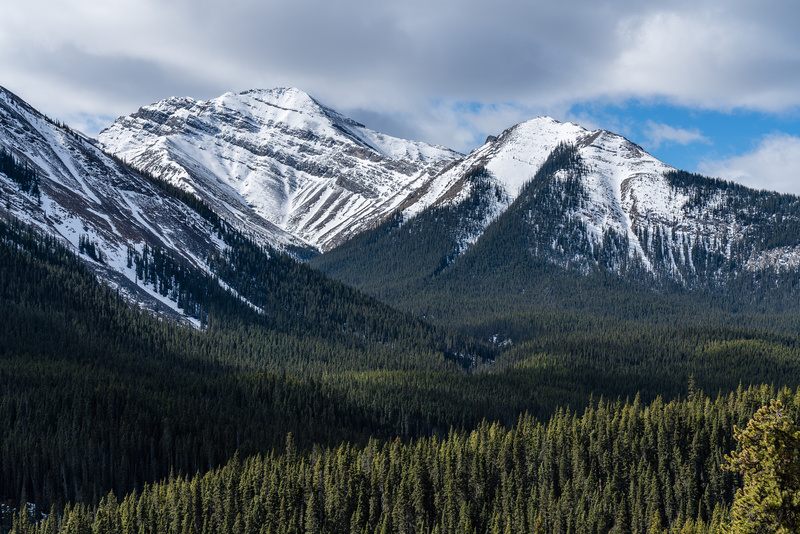 In 2017 Bison were re-introduced to Banff National Park and the chosen area for their new home was the exact one I’m talking about, the upper Red Deer, Panther, Dormer and Cascade River valleys. For a good read on this ongoing effort go to the Bison Blog. I should note that the area is currently closed to the public for calving season with hefty fines promised to those who ignore it. 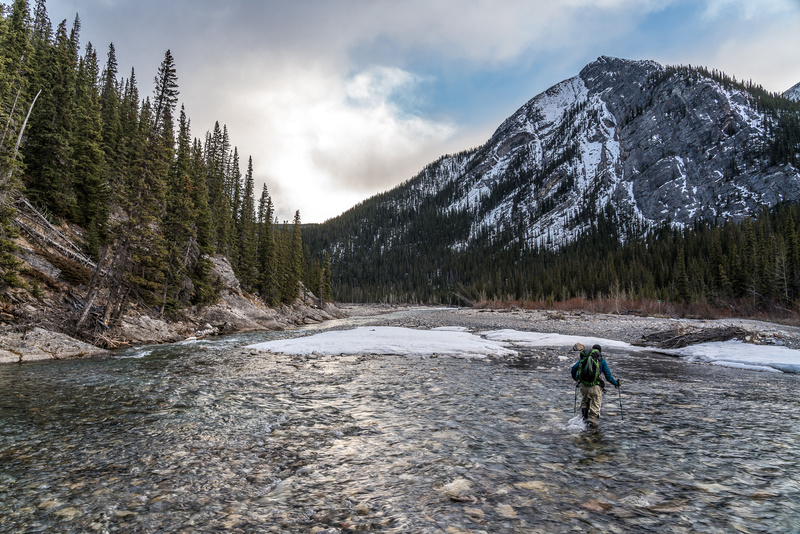 The Bighorn Backcountry is an area including more than 5000 square kilometers (1.2 million acres) of public lands east of the Banff and Jasper National Parks. 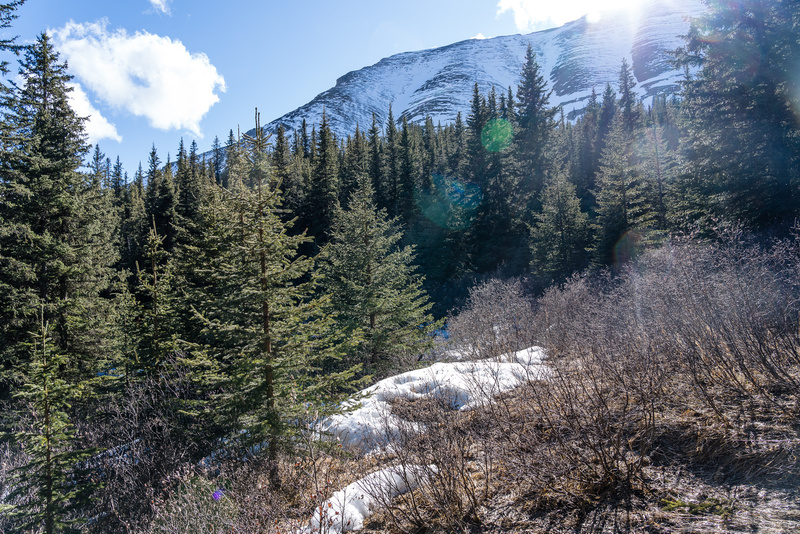 It is subdivided into six Public Land Use Zones (PLUZ), land areas and recreational activities allowed in each PLUZ can vary greatly depending on local conditions. See this brochure for much more information. 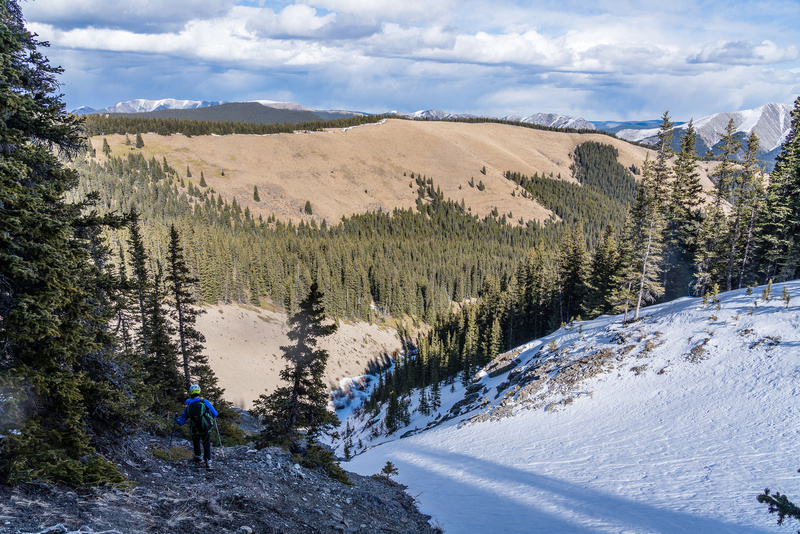 We traveled through both the Dormer Sheep PLUZ and the Panther Corners PLUZ both of which are located in the Bighorn Backcountry. 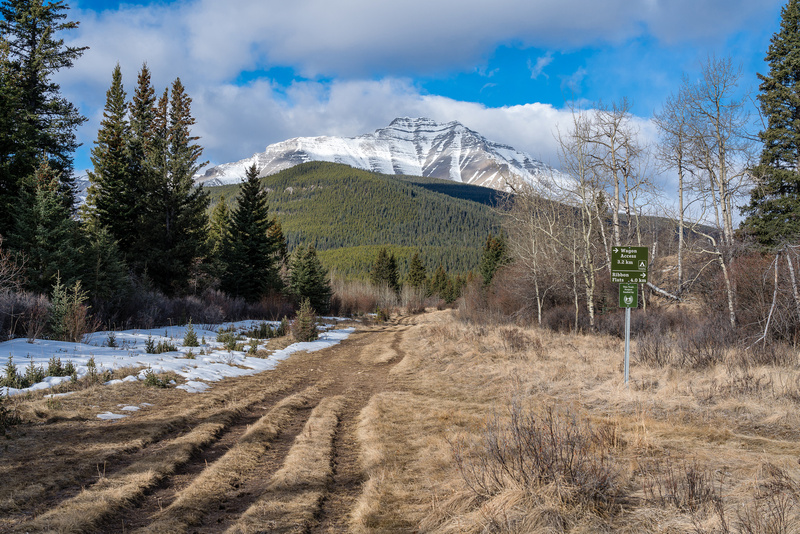 I’m sure the local outfitter maintains and assembles many of the summer camps / trails here while other camps, trails and tracks in this area of the Rockies are maintained by the Alberta Trail Riding Association. There are some pretty neat YouTube videos on horse camping along the valleys of the Bighorn, some of which inspired us. 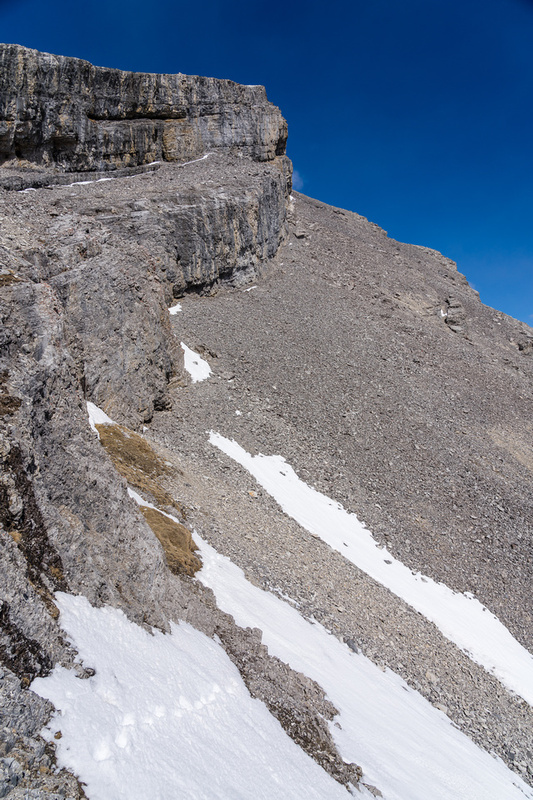 Snow on the east face would be detrimental to a summit attempt and downright dangerous. 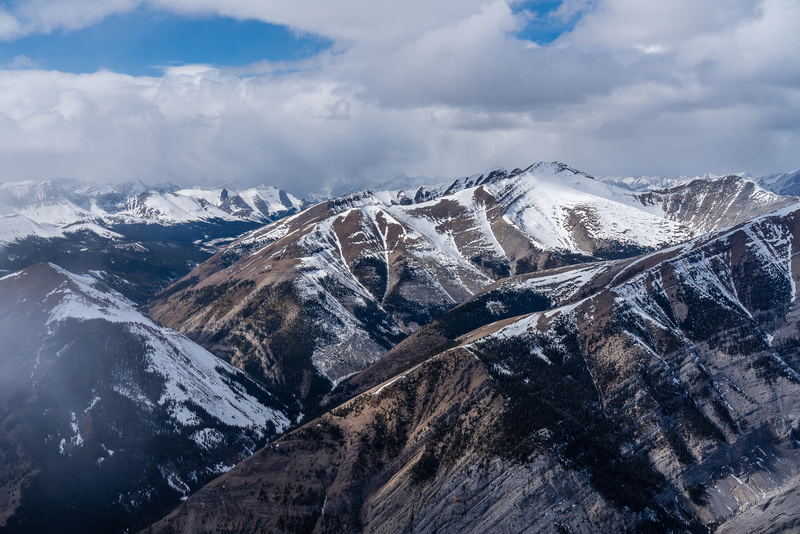 With a classic up-slope storm moving through the Rockies since our Winchester attempt, there was guaranteed to be snow on the east face. We’d almost certainly have to find another way and wouldn’t know until 99.9% up the peak whether or not we’d find another route. 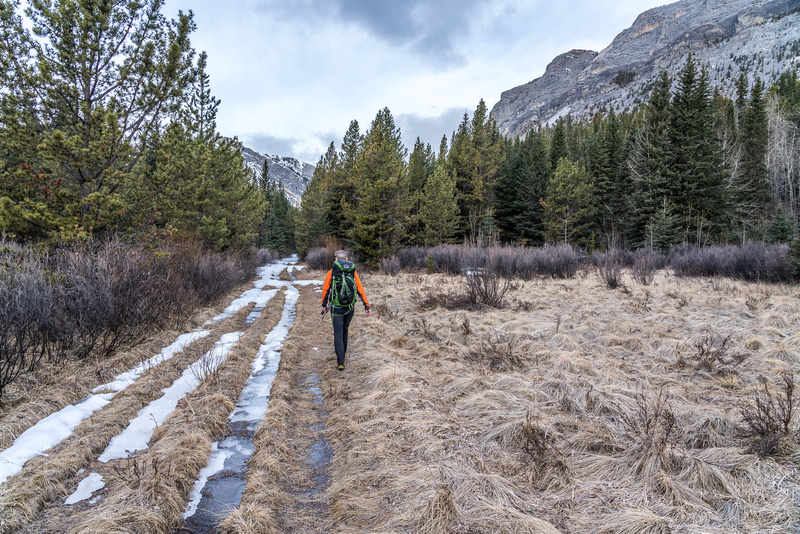 There are a myriad of trails, horse tracks and overgrown paths all working to confuse the heck out anyone attempting to follow them and adding up the distance and the time spent hiking. With possible snow on the trails and guaranteed muck this would only increase their complexity and the length of our day. My biggest issue with attempting Dormer so early in the season was the fact that we’d be using our lightest gear. The only way Phil and I execute huge days in the mountains with our (my) aging bodies is through the careful pruning of gear to the bare necessities and then a little less than that. 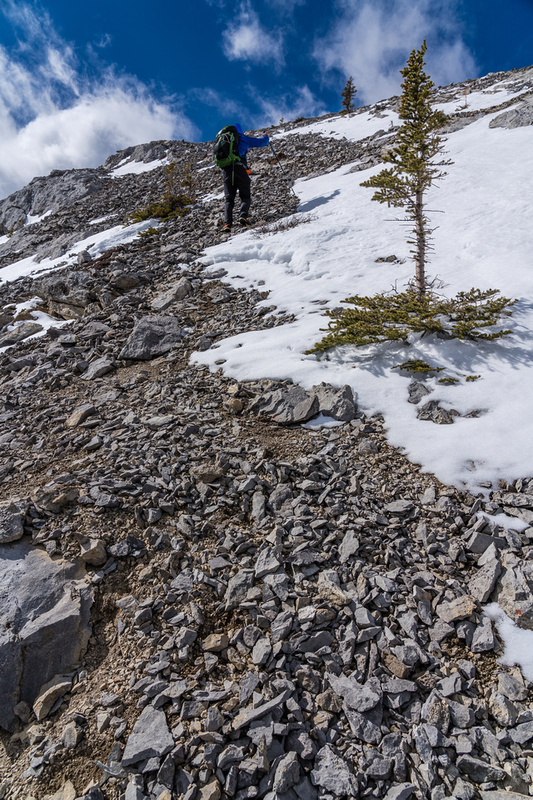 Then we cross our fingers and hope that we didn’t ditch that ONE piece of gear that we would need to make the summit. So far we’ve been pretty darn lucky but we all know that luck has a bad habit of being unpredictable. We planned to hike in approach shoes and we weren’t taking snowshoes or axes. Clothing, food, water were all kept to a very bare minimum. I didn’t even carry water for 30 out of the 37 kilometers, knowing that we had eight river crossings to hydrate at. We did carry light crampons as we knew there would be some snow issues. 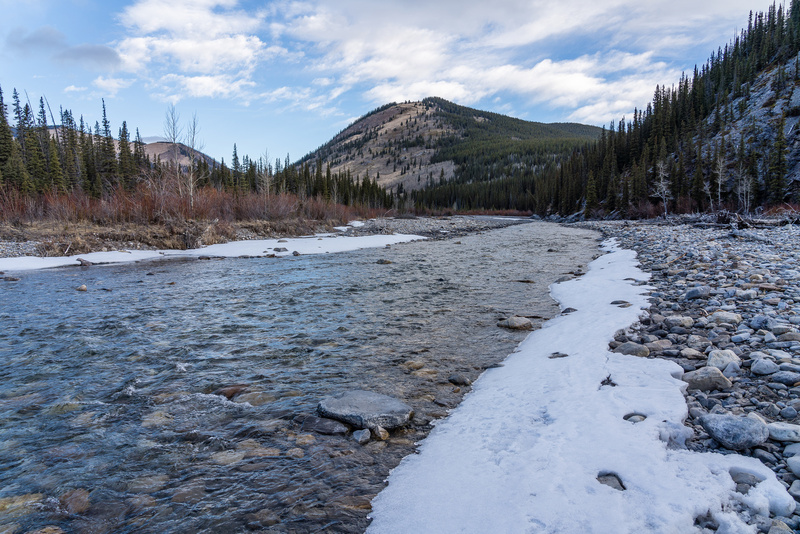 All of this was on my mind as we drove up the gravel roads towards the Panther River. As we parked along the Panther Road I was still not convinced we should be there. 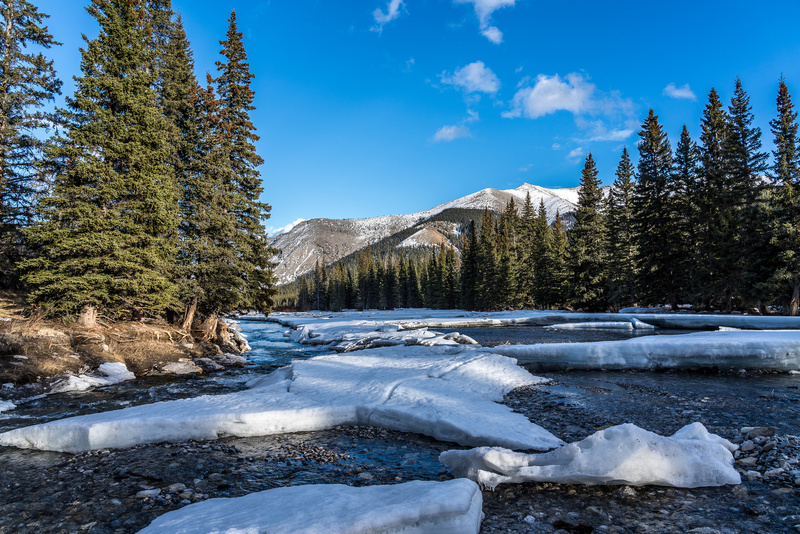 But we were, so we packed up our gear and rambled onto the snow/ice covering the banks of the river, pushing our bikes and wearing our waders. Yes – we brought bikes. In a burst of silly optimism we thought maybe, just maybe, the wagon trails we were using for approach would be melted out enough to bike. Dreamers. 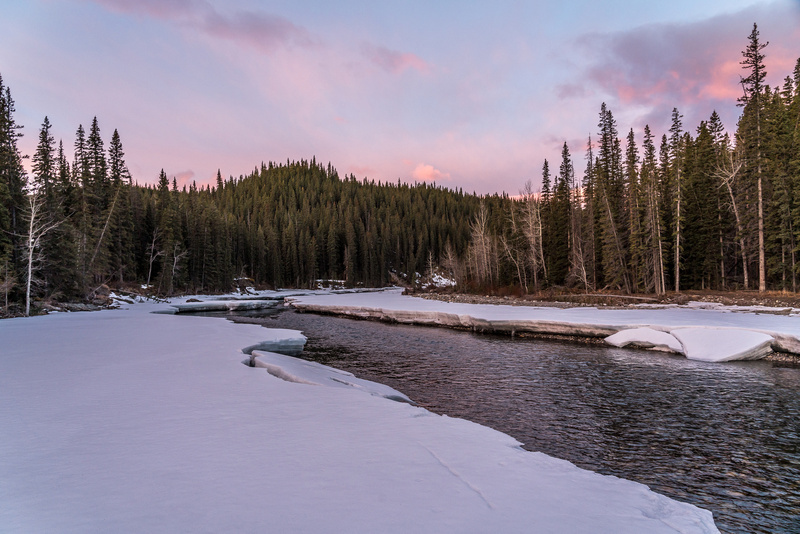 A gorgeous sunrise lit up our world in soft hues of pink and orange and boosted my mood but getting lost right off the bat after crossing a very tame Panther River didn’t help to settle things. Soon I realized my navigation error and we were pushing the bikes up a very steep, rutted road that would intersect the new wagon trail roughly 1.5 km from our crossing point. 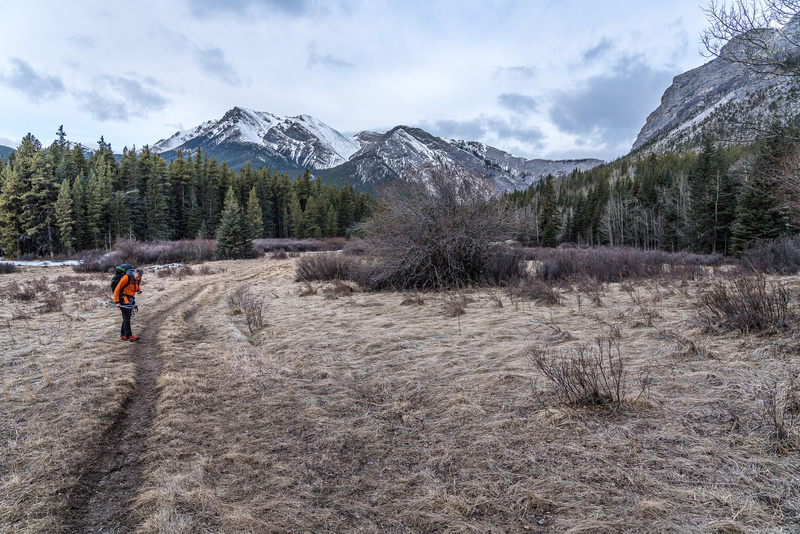 Let’s talk about the trails in the Panther River / Bighorn front country for a minute. There’s a lot of them! We plotted what we thought was the most efficient route but there’s many options here and all of them involve compromise. 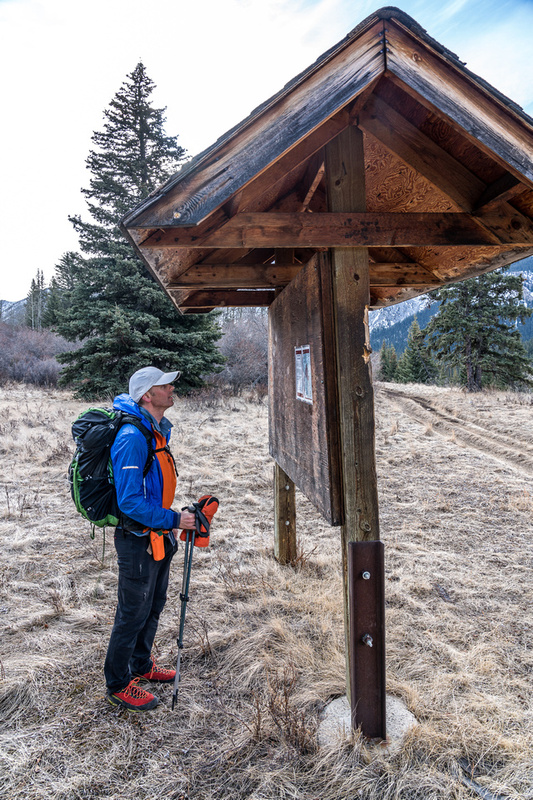 Using the new Panther River wagon trail has the advantage of being wide, easy to travel and relatively dry. It also involves more distance and more elevation gain / loss. Using the older tracks is more direct but also more swampy and less obvious in places. We hoped for some freeze and chose the more direct and swampy option. Early morning light as we cross the Panther River near the Panther Road and our parking spot along it. As we biked an icy track towards the first major intersection of the day we had no idea what to expect. 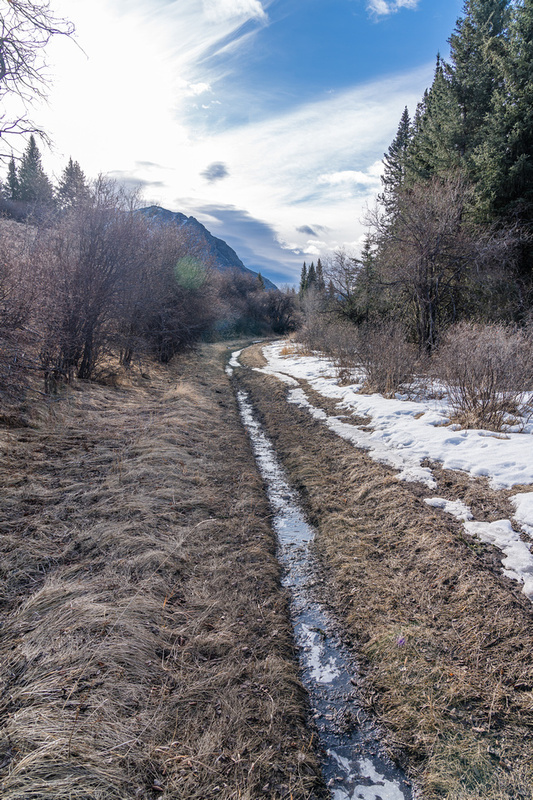 Would the wide, new wagon trail be clear of snow? I was the first to arrive at the intersection and knew right away we were screwed as far as bikes were concerned. There was a lot of snow on the trail. Less than on Winchester, but similarly, there was tons of snow on the open road and nothing in the forest right beside it. Phil agreed that we’d be abandoning the two-wheeled steeds and we proceeded on foot from the first intersection. 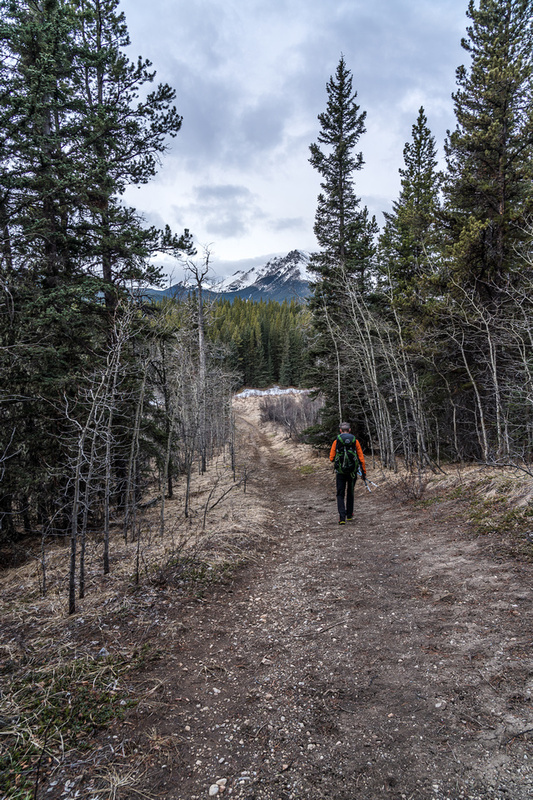 As we walked along the first section of new wagon trail in ankle to calf deep snow in our runners, I reminded Phil that we had approximately 15 kilometers of hiking just to get to the base of our mountain. 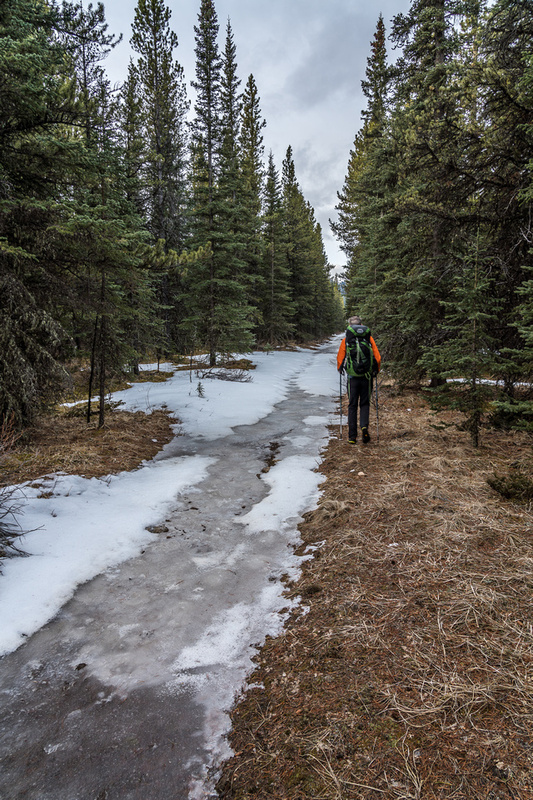 Progress wasn’t horrible but it’s hard make efficient strides when you’re trying not to slip on ice, bury in deep pockets of snow or step in oozing muck. At this point of the day, not even an hour into it, I was putting any chances of success at around 15%. Maximum. 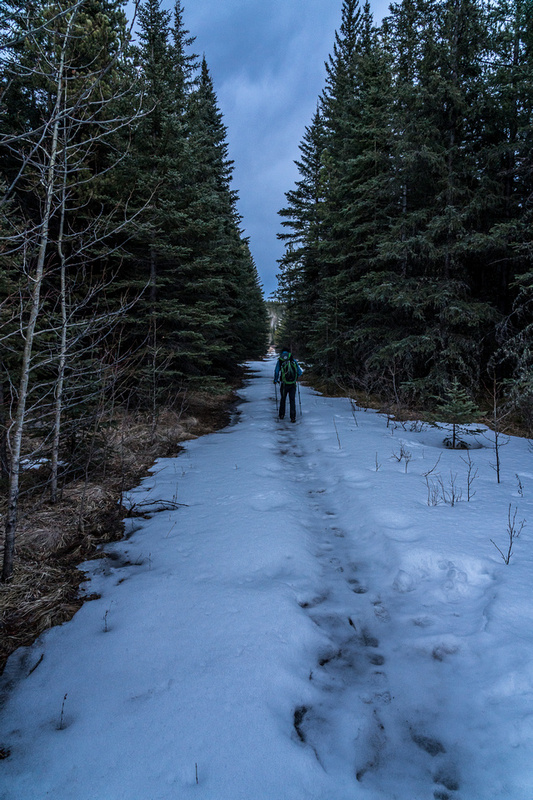 Phil stayed positive but I could tell he wasn’t too thrilled with all the snow on the trail at this low elevation. 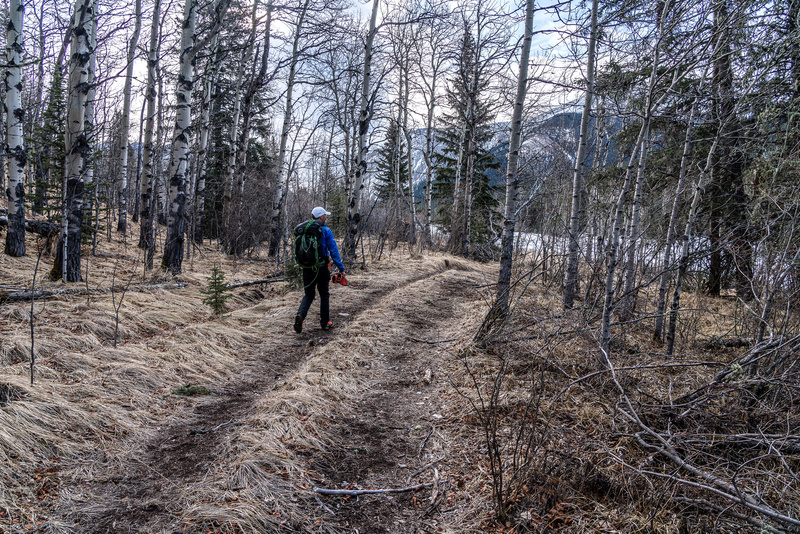 As we started tramping down an obvious cut-line on the old wagon trail conditions didn’t improve. Stubborn snow clung to the open track and although the ground was frozen this early in the day we could tell it was muddy underneath. Hiking the old wagon trail. A deeply horse-rutted shortcut along the old wagon trail. 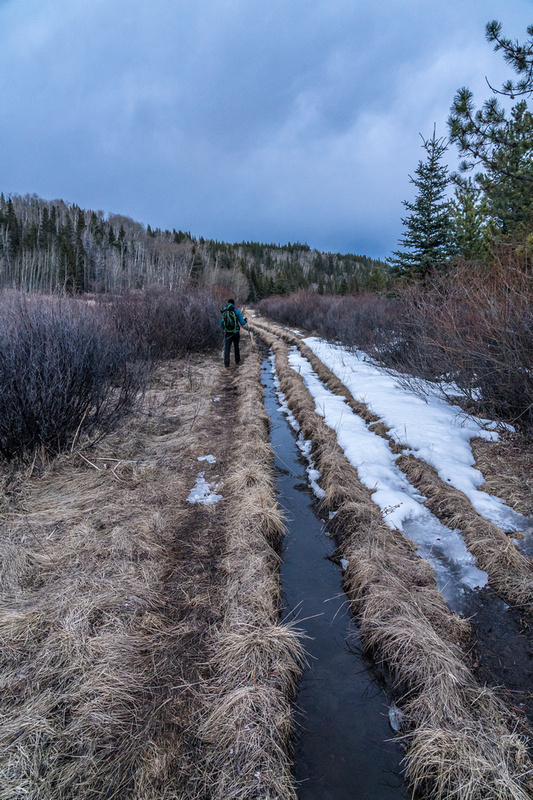 Conditions slowly started to improve as we lost height from our cut-line track into a swampy valley. 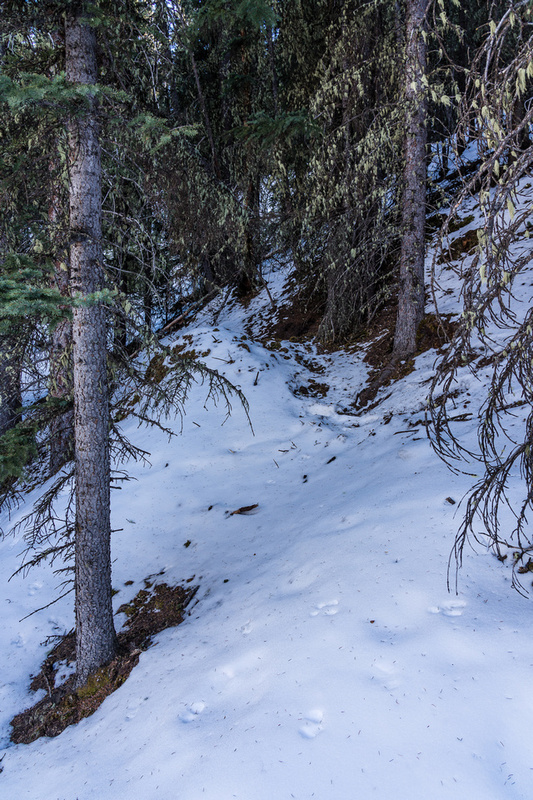 It was here that we first noticed sets of very fresh Grizzly tracks in the muck and snow on the trail as it regained height out of a small depression. 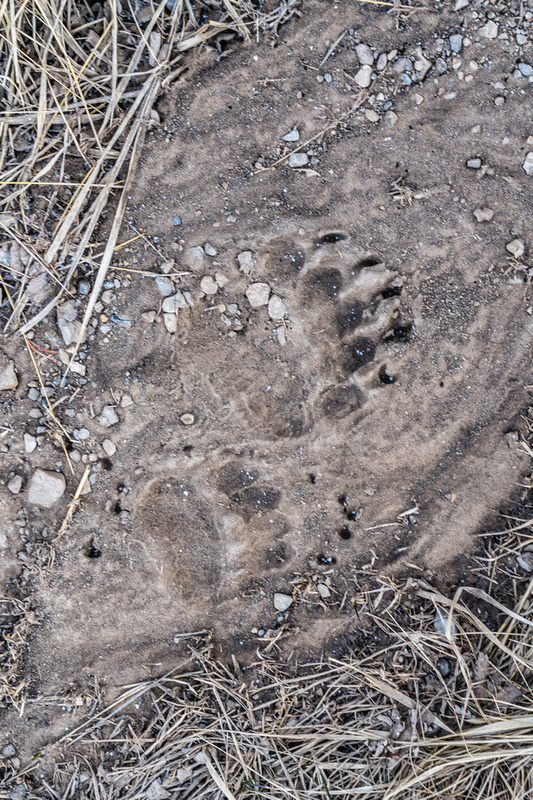 It was so cool to see two cub tracks alongside the much larger mamma tracks! There’s no feeling like literally walking in the steps of a large Grizzly with cubs. The good news was that the tracks were exiting the valley (coming towards us). These areas were boggy later in the day and probably wouldn’t work great for bikes then anyway. The gap is just visible above Phil’s head in the distance here. As we marched in the footsteps of the bruin family we started absorbing the happily chirping birds in the warming forest surrounding us. We inhaled the intoxicating aroma of Spring and started enjoying a few drier sections of trail with views over the Panther River on our left. Slowly but surely the familiar feelings of being immersed in the wild crept into us, immersing us into a world so distinct from the concrete jungle of our other life. Smiles slowly replaced worried lines. Our chatter slowly became more and more optimistic instead of cautious and gloomy. 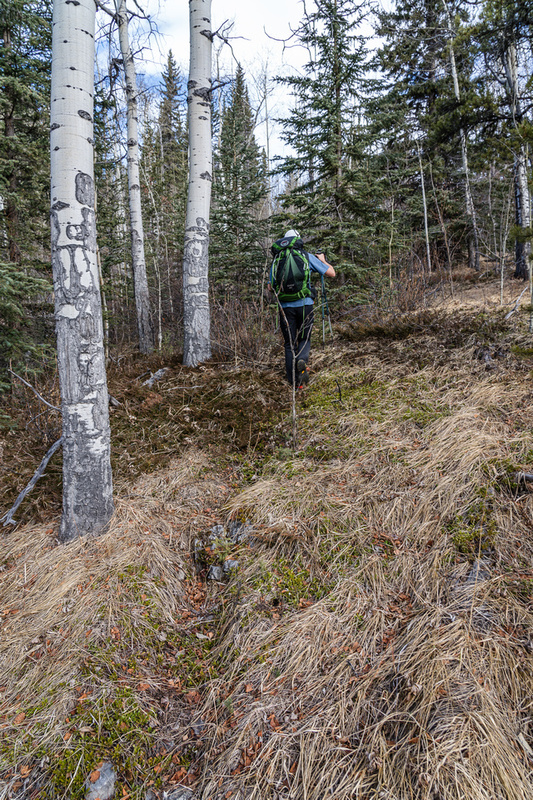 Our pace increased slightly and our hiking poles dug into the ground with more conviction. Slowly but surely we found ourselves deeply contented with being exactly where we were. The 2nd and 3rd crossings of the Panther River at the gap. There is a way to avoid the crossings OOS at right but it’s not perfect either. Within 1.5 hours of first crossing the Panther River we found ourselves hiking down a very maintained trail towards our 2nd and 3rd crossings at “the gap”. The crossings were close together and leaving the waders on worked well here. 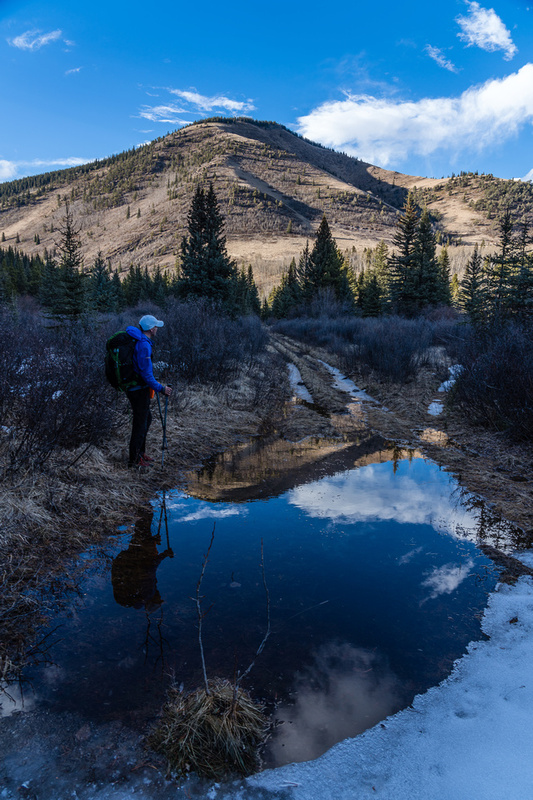 After taking the waders off and getting back into our hiking shoes we both commented that now we felt like we were “out there”. The gap is where the Panther River cuts through a ridge running from Winchester to what the locals refer as “Sheep Ridge”. 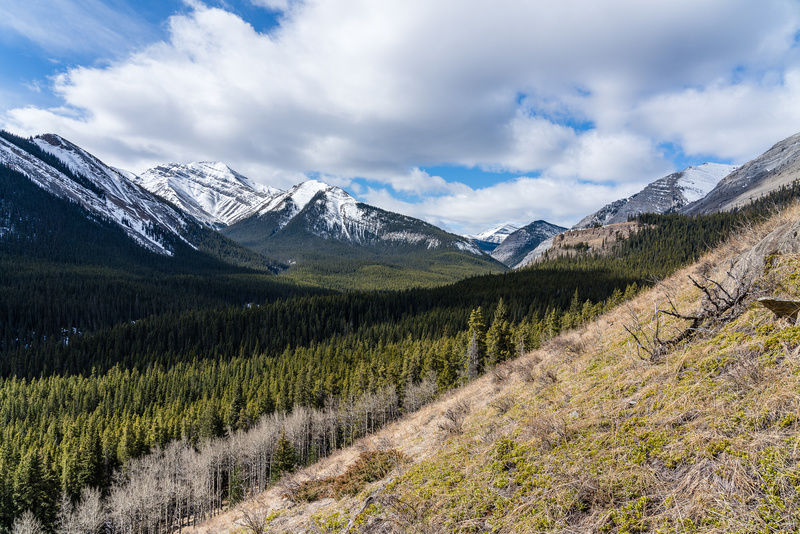 Once through this gap a gaggle of wagon / horse trails navigate towards either Eastern Banff up the Dormer or Panther River, or towards Ya Ha Tinda up Dogrib Creek and the Red Deer River. 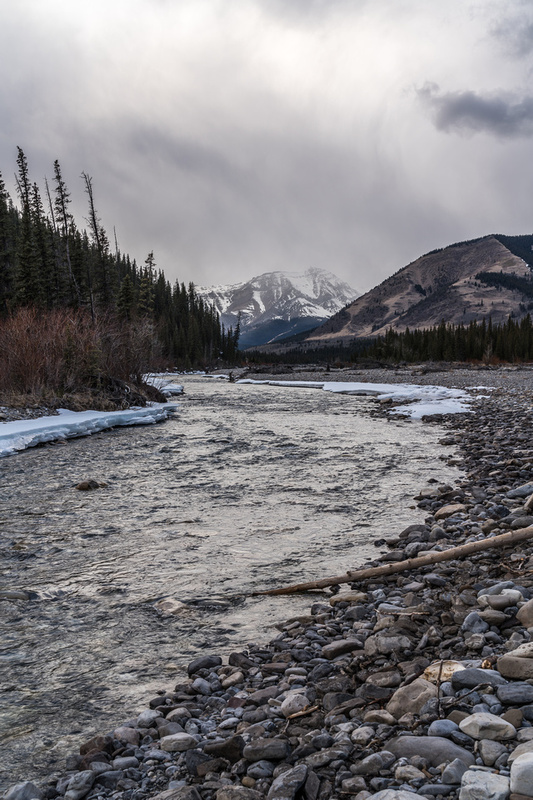 We were planning to follow a wagon track in an arc from the gap along the north side of the Panther River before looping back across it and continuing south along the west banks of the Dormer River upstream of its confluence with the Panther. The gravel flats at the gap. Barrier Mountain just visible in the far distance. Dormer lies to its left, still out of sight. We’ve traveled around 6km at this point. Our day kept improving as we hiked briskly through the open grassy meadows after the gap. 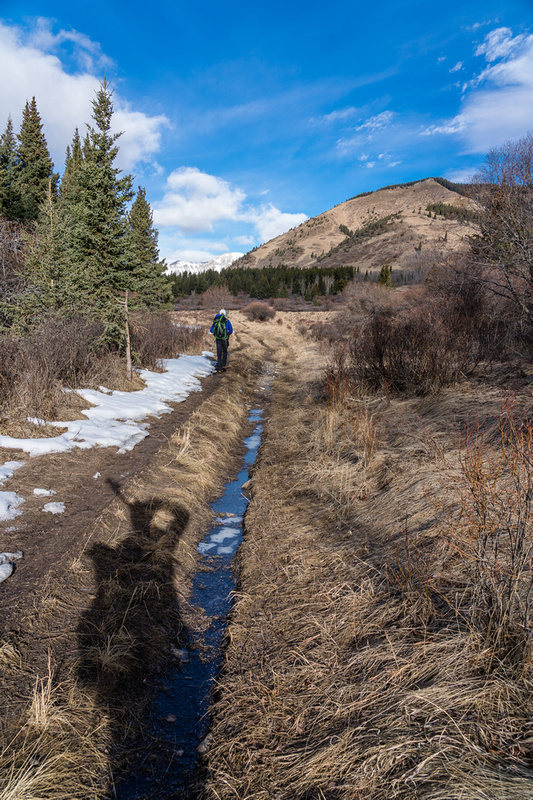 The snow was almost completely melted in the open terrain and the sun came out, turning a slog into a very pleasant trek. Wolf tracks and even more and fresher Grizzly tracks were added to our own. 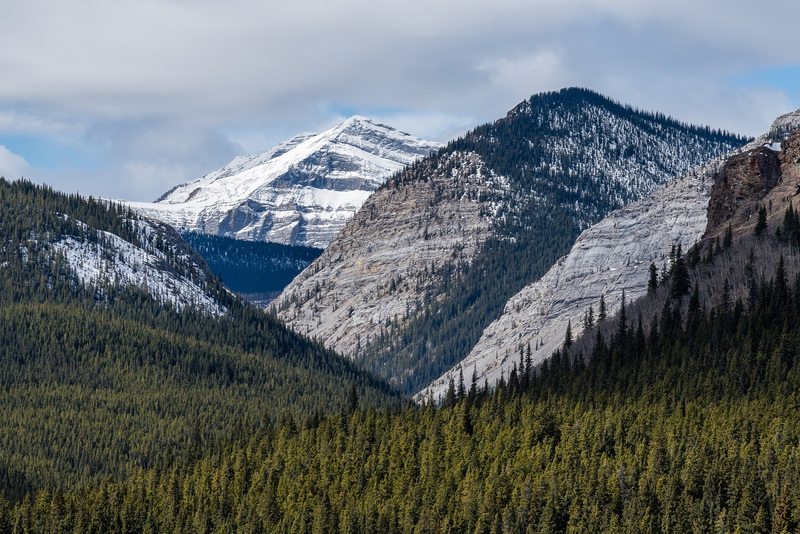 The views towards Barrier Mountain were very dramatic and Dormer looked big and distant as we worked our way along the wagon trail to our 4th and final river crossing. Phil marches along a wagon trail. Dormer Mountain visible at center right in the distance. Hiking the flats from the gap to our 4th river crossing. Phil reads a sign indicating the bison area restrictions ahead up valley. The area is closed for calving season. Hiking high above the awakening Panther River in the warm sunshine with birds chirping and dry grass underfoot was exactly the mojo building magic I needed this trip to be. Sure! Dormer’s east face looked plastered in fresh snow and totally impossible to ascend, but it was hard to care in this peaceful atmosphere. Our 4th crossing of the Panther River which is very low and gentle this early in the season. 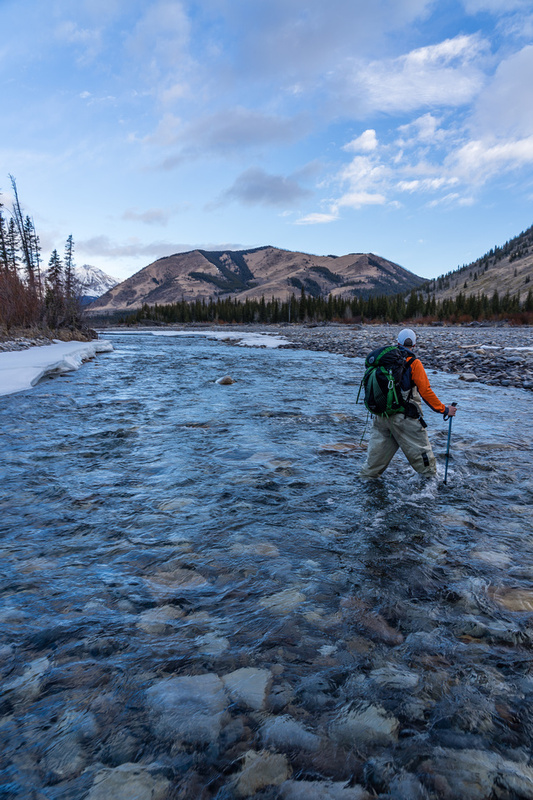 Crossing the Panther River for the 4th time was easy (knee deep at most) and soon we were scouting a much smaller track leading up the Dormer River above its NW bank. Early morning light as we cross the Panther River. Hiking along the wagon trail. The ground is frozen here, preserving recent tracks. Walking in the footstep of local residents. These areas were boggy later in the day. Back on the new wagon trail. The 2nd and 3rd crossings of the Panther River at the gap. 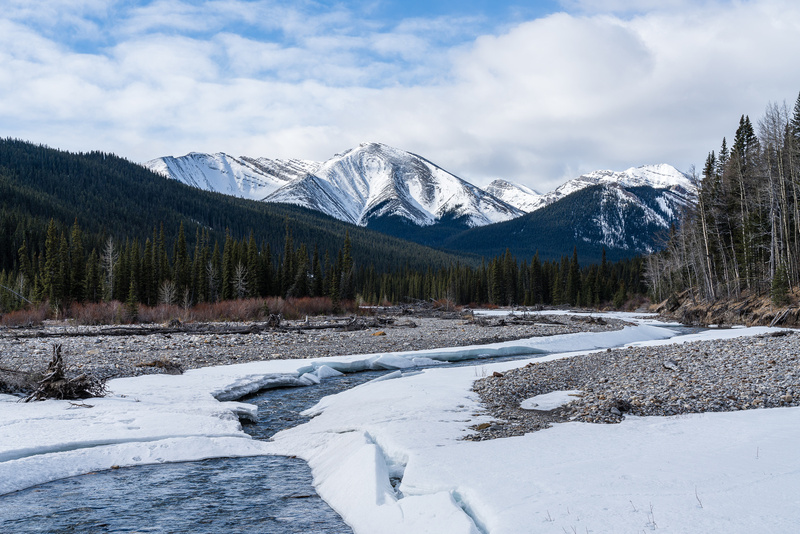 Barrier Mountain and the Panther River. Dormer is still a long ways off at left. Signs indicate wagon trails in the area. 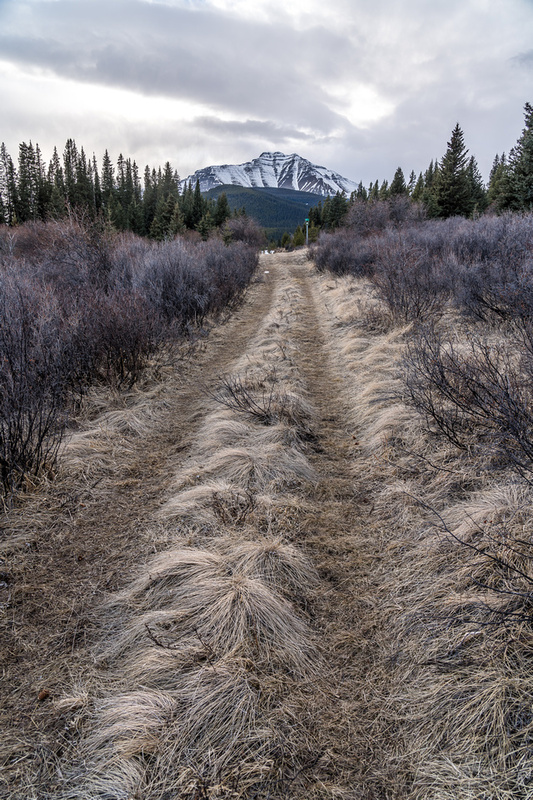 The wagon trail and Dormer Mountain. Phil marches along the wagon trail. Nearing the confluence of the Dormer (L) and Panther (R) Rivers. Phil reads a sign indicating the bison area restrictions ahead up valley. 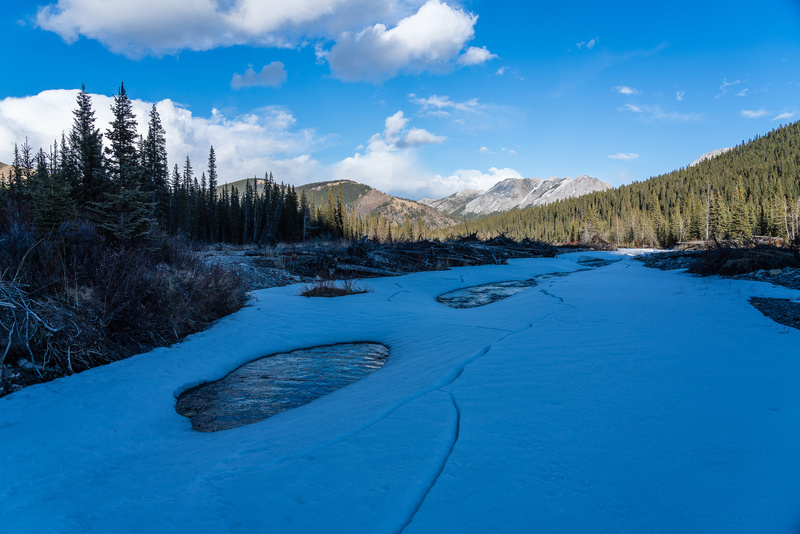 The trail approaches the Panther River again. Our 4th crossing of the Panther River. Very low and easy in early Spring. 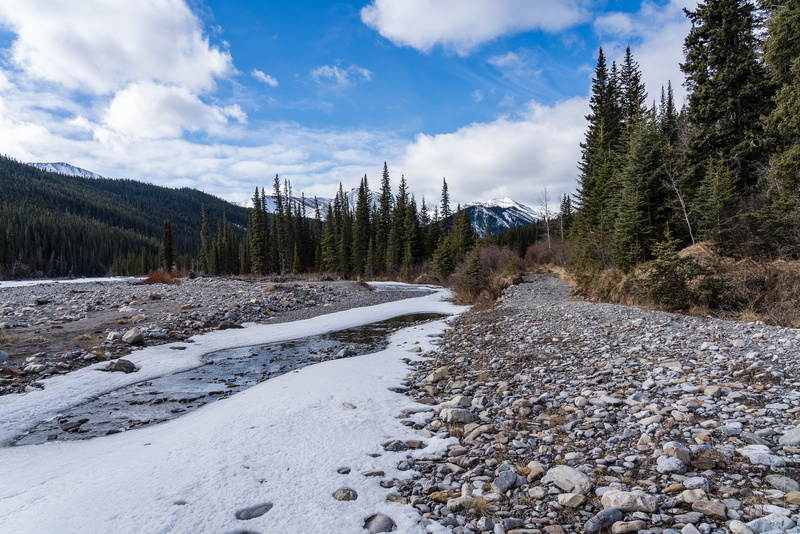 The trail deteriorates significantly along the Dormer River. Hiking alongside the Dormer River. Starting to feel "out there" now. 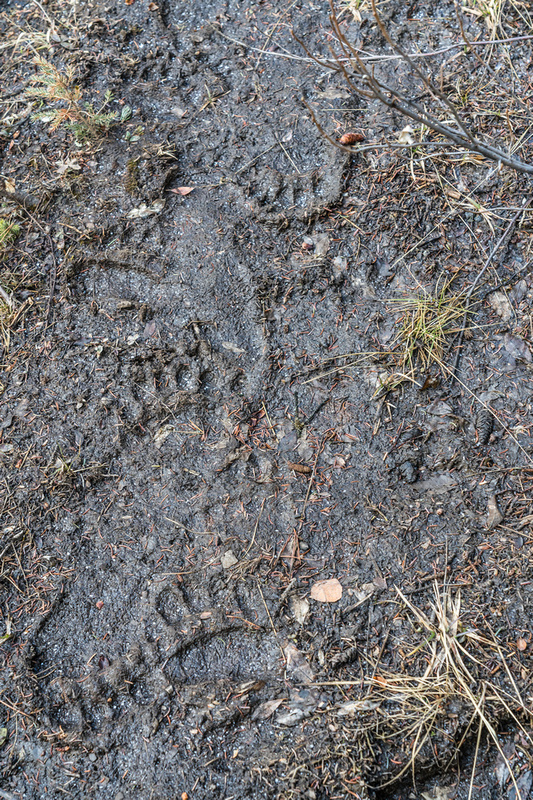 A myriad of grizzly tracks going every which way. 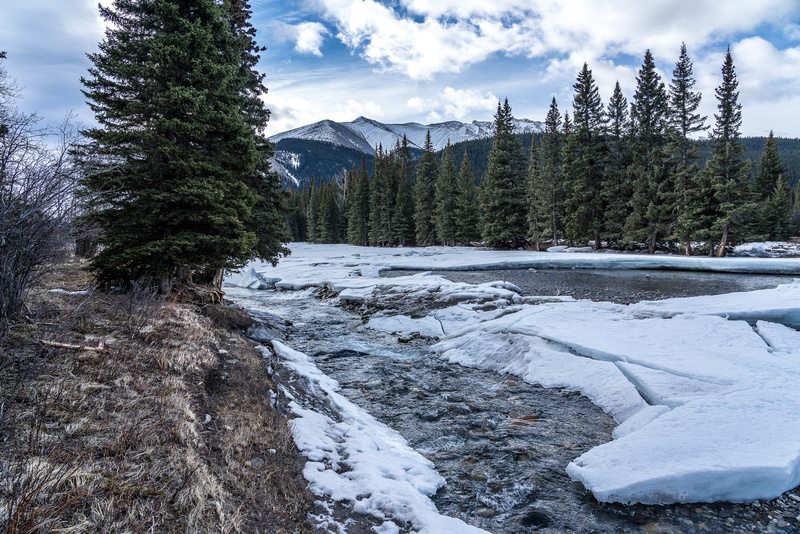 Hiking up the Dormer River. Starting up the lower SE ridge of Dormer. 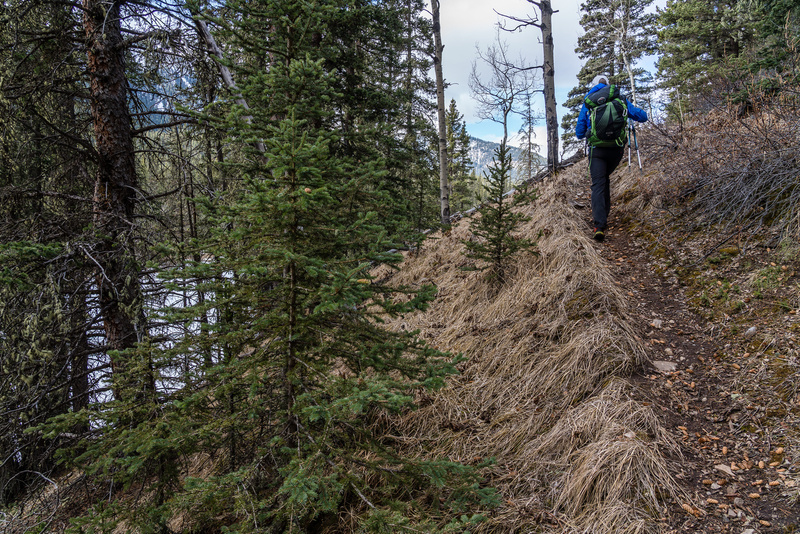 For the most part the trail up the Dormer River was obvious and easy to follow. There were some swampy sections and some flood debris working against us but we were officially cheered up and nothing was stopping us at this point! We were now really “out there” and by the time we finally reached the base of our ascent slopes we were 15 kilometers and 4 hours into our day. 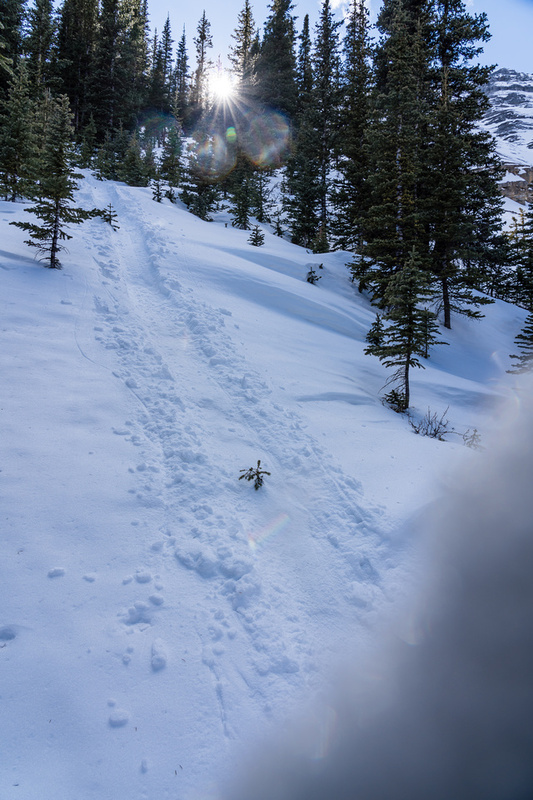 A myriad of grizzly tracks going every which way. This was a constant theme throughout the day – not an isolated case! There was nothing left to do but get on with it, so up we went! 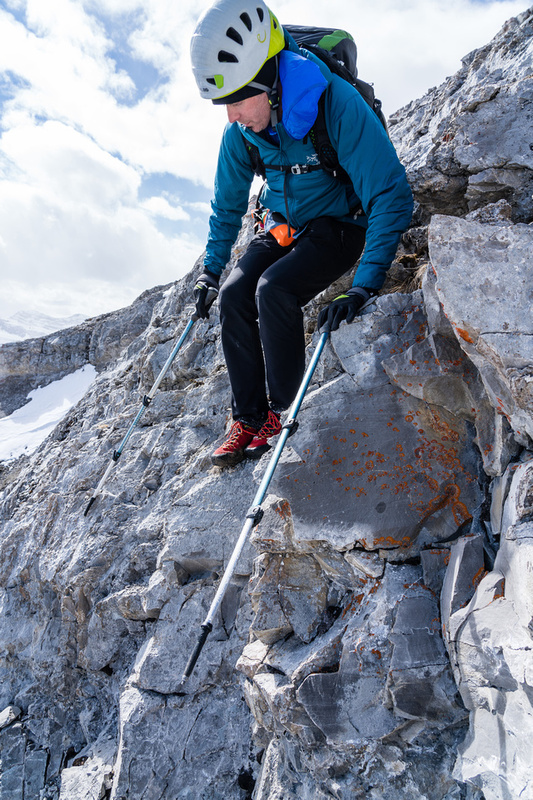 Phil had scouted open slopes on Google Earth and his ascent line up the SE ridge worked perfectly. We slammed through the first hour of ascent and I couldn’t believe it when we found ourselves at tree line already. 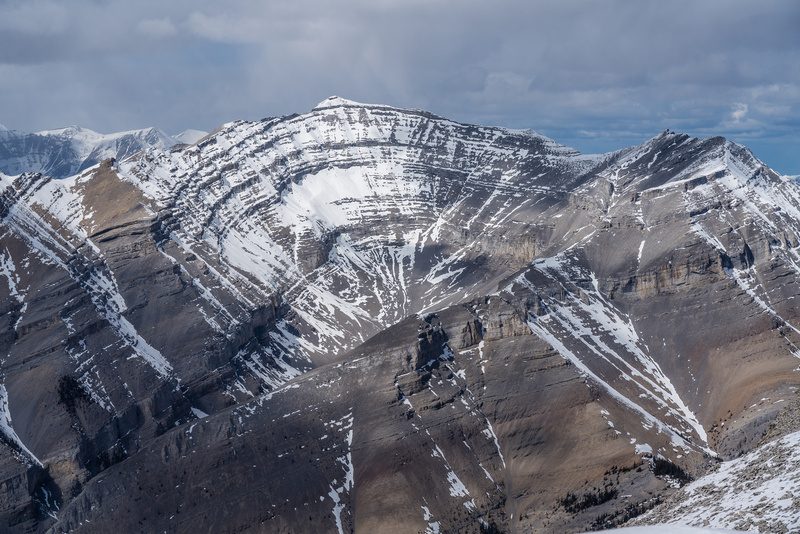 Wicked views of Winchester Ridge, Otuskwan Peak and Puma Mountain kept us entertained as we started up loose, rocky, slabby slopes around the first set of cliffs blocking direct access from the lower ridge. A gorgeous day on the SE ridge of Dormer as we work our way to tree line. Otuskwan at center left with Puma out of sight beyond at this point. Dormer is just peeking over the trees above Phil’s head. 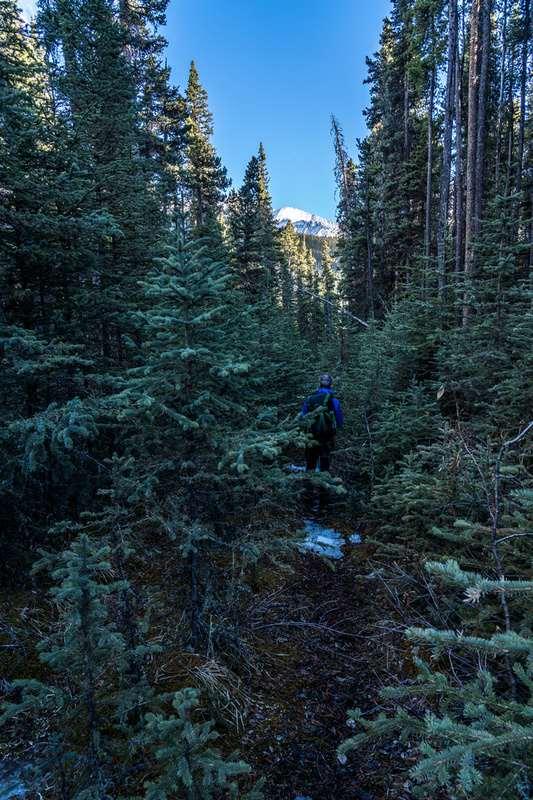 Our mountain starts to finally show up as we hike the very pleasant lower SE ridge to tree line. The south ridge at far left here. 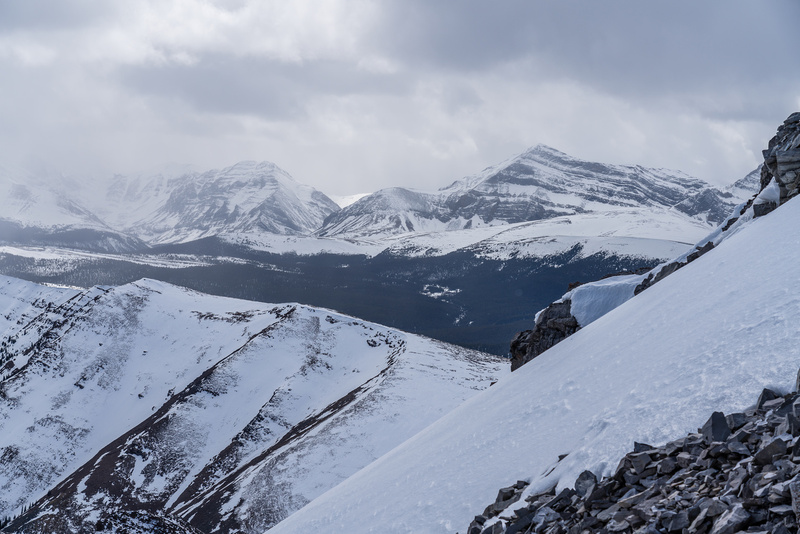 Looking back down the SE ridge towards Winchester Ridge and Otuskwan Peak. 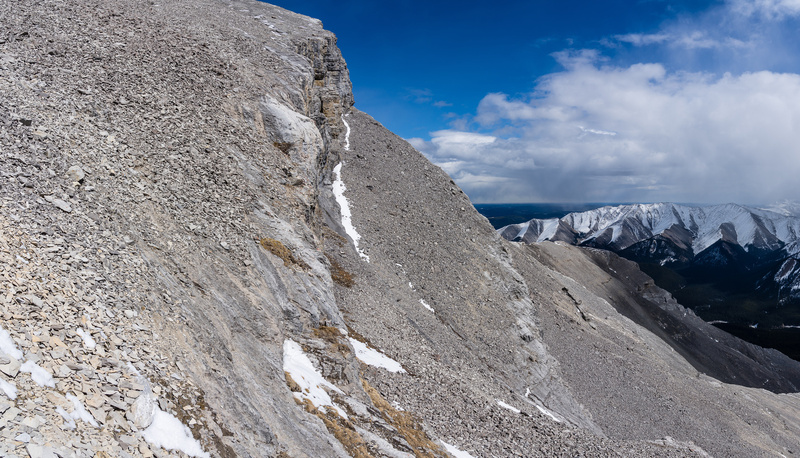 Panorama from the SE ridge looking over our exit “grassy ridge” at left. The Dormer River in the valley below. 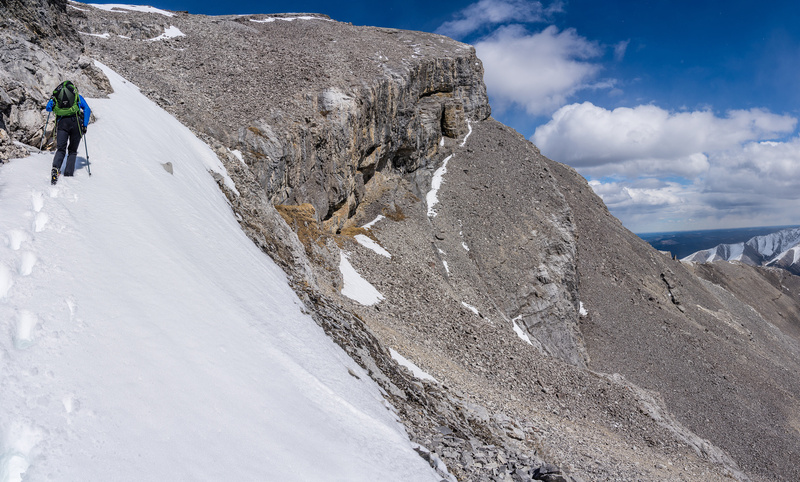 We followed Cornelius’ route up the SE ridge, deviating climber’s right (east) around all obstacles on a mix of slab, scree and unconsolidated snow. The scrambling was never more than moderate although some of the slabby bits felt upper moderate to me when I looked back down. 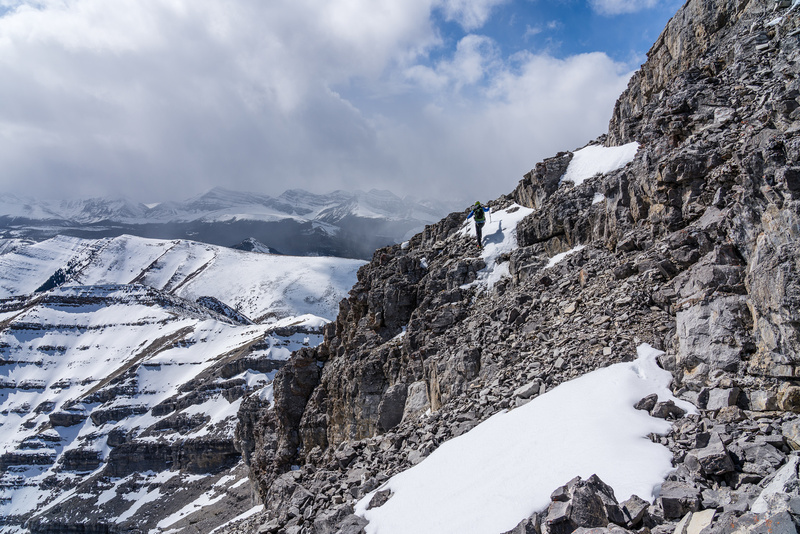 As we ascended, the snow traverses became more and more tricky until we realized we’d certainly have to find an alternate ascent to Cornelius’ line on the upper east face which was plastered in snow with a huge run-out to cliffs far below. Phil and I have commented before that we seem to get awfully lucky with unplanned routes working out. Dormer Mountain was no exception. Scrambling the SE ridge, going around obstacles on the east side. 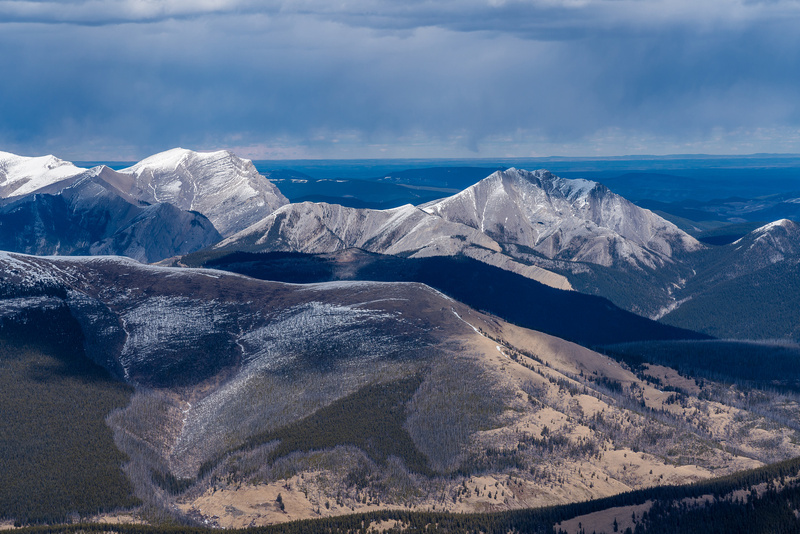 Puma Mountain is over 10,200 feet high and at the north end of the Palliser Range. As we ascended high on the ridge we noticed a huge bowl forming to the west on our left. The bowl had many cliffbands running across it but looked to have some weaknesses higher up. The issue was going to be how to get to these weaknesses. We knew if we could only get to the upper SW ridge under the summit, we’d have no more problems getting up to the peak. 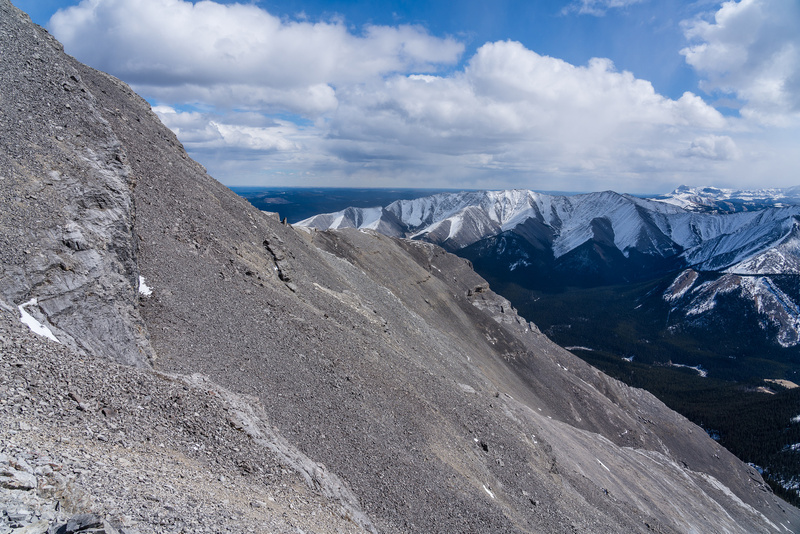 Although they looked a little crazy from the SE ridge, we did notice two possible lines leading down scree benches beneath huge cliff faces above us. These benches looked like they might be slabby and steep but if we could navigate them roughly losing 100-150 vertical meters, we’d be at the weakness in the center of the bowl with a possible route from there back up to the easier SW ridge. Of course we couldn’t know if any of this plan would work until we got our noses in it. 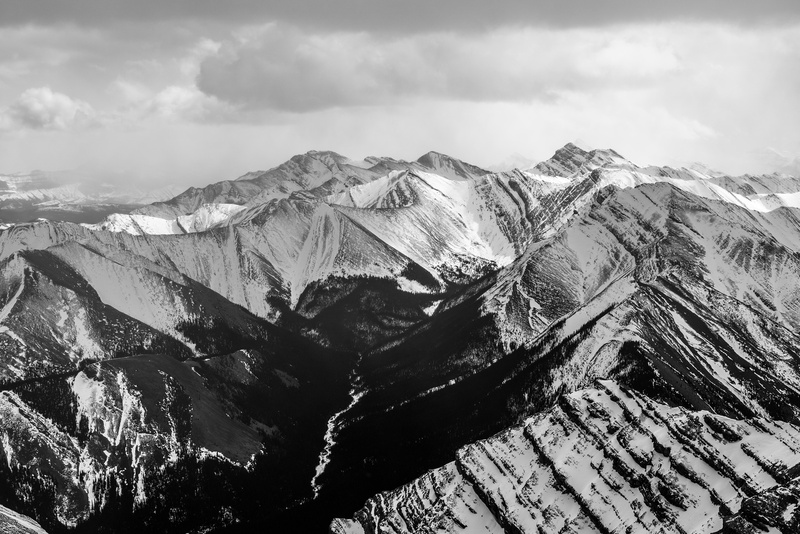 Views back over the grass ridge (L) and Dormer River towards Winchester Ridge (C) and Otuskwan Peak (R). 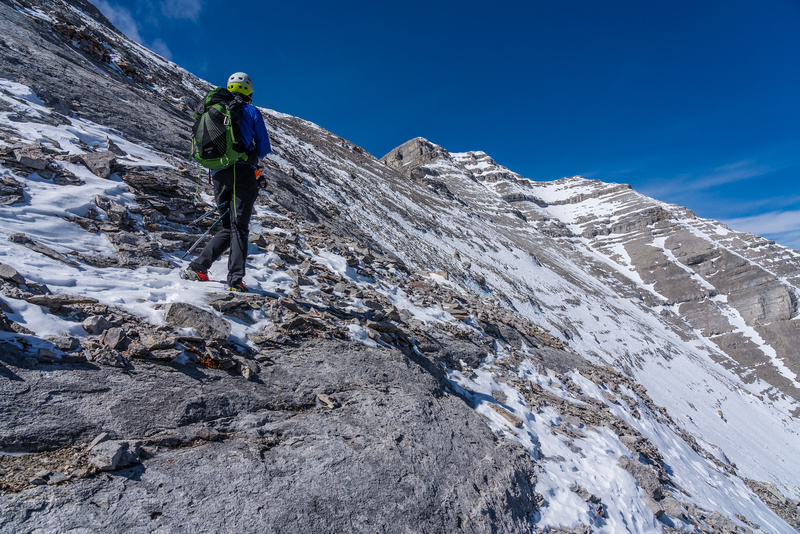 After ascending to the decision point of either going right onto the east face or left down ledges we noted that we could for sure work our way down along the base of the imposing summit cliffs. 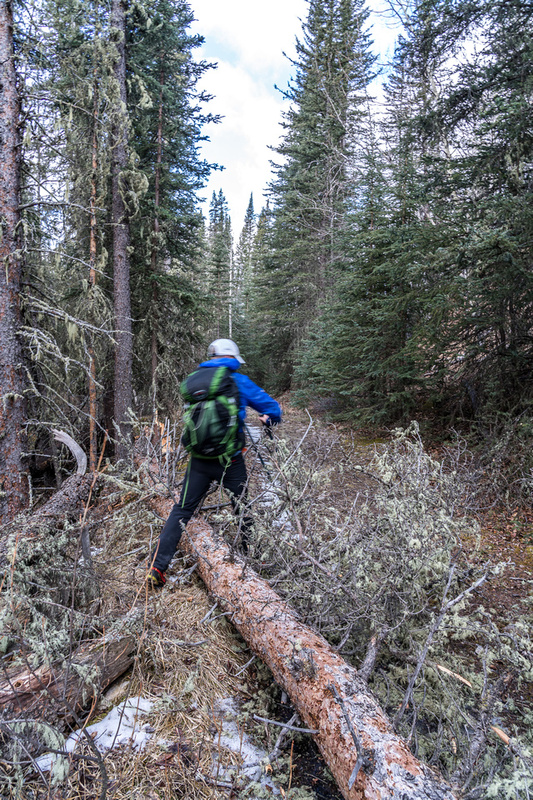 We quickly checked out Cornelius’ route before turning back – no way we were attempting that in runners with no axes! Even with mountaineering gear I wouldn’t have tried it – the consequences of a slide were too great as Cornelius notes in his trip report. We started descending the scree / slab shelf above the huge SE bowl. The blocky scree and slabs made for slow going but eventually Phil looked up and wondered if the terrain above us would go. I agreed that we should give it a shot. 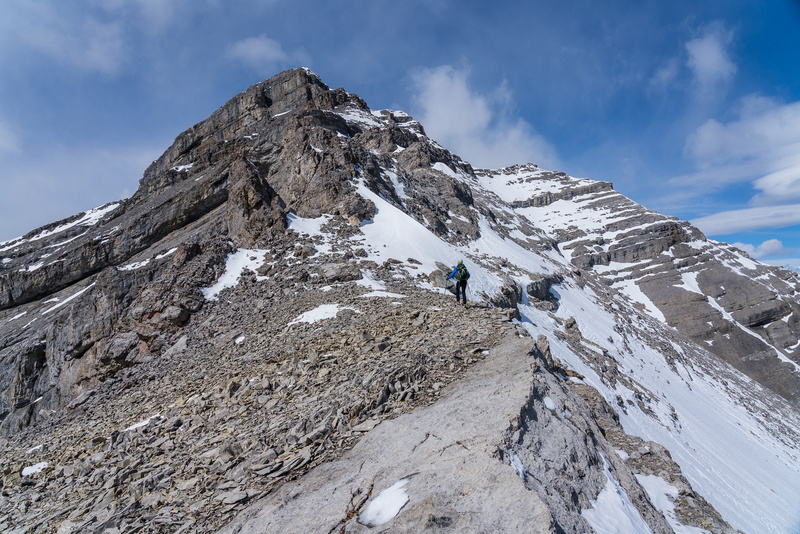 Moderate scrambling up several small ledges and low cliffs brought us to the SW ridge with the summit looking like an easy stroll above. We left plenty of cairns to guide us back down this slightly confusing access route. Scrambling along the scree ledge. Looking back along the ledge we descended from the SE ridge as we cut back up the center of the south bowl. The cliffs that block easy summit access are obvious now! 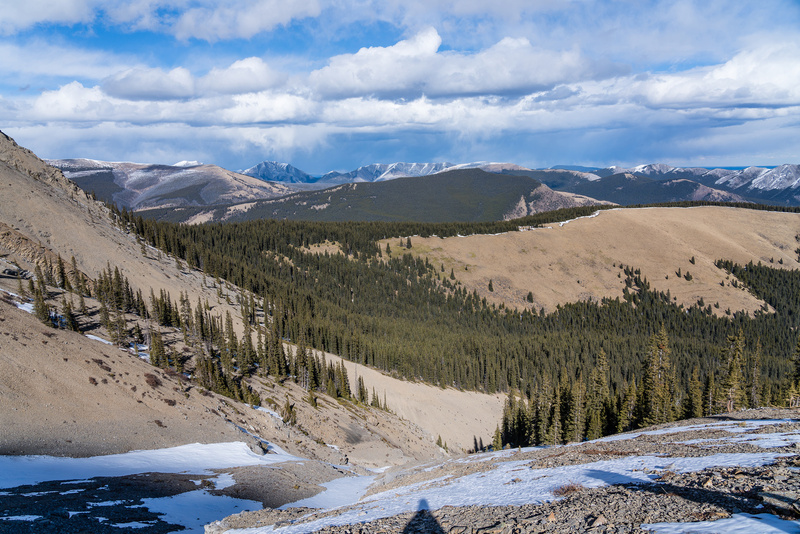 The views from the SW ridge towards the upper Dormer River valley and bison grazing area were stunning! 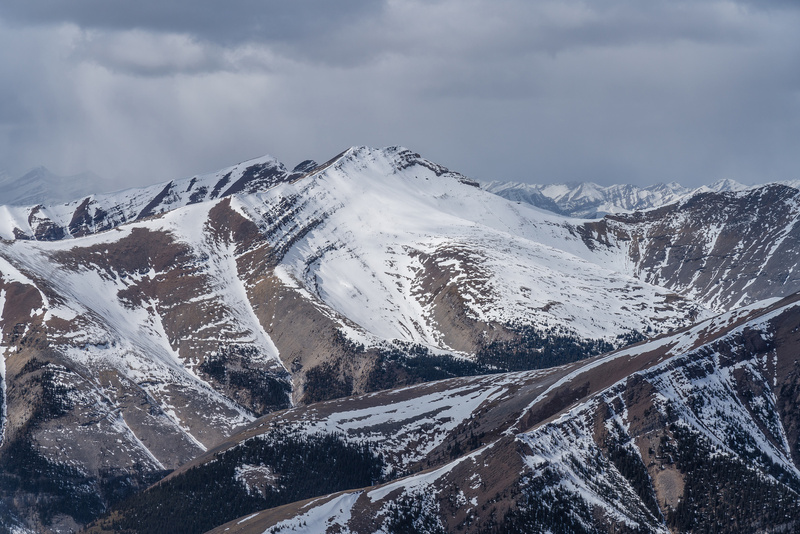 I used my telephoto lens to take photos of the large open valley, complete with the burn that was used to generate healthy grazing for the bison herd. We noted some weather moving in rapidly from the west and the wind finally made an impact now that we weren’t protected from it. 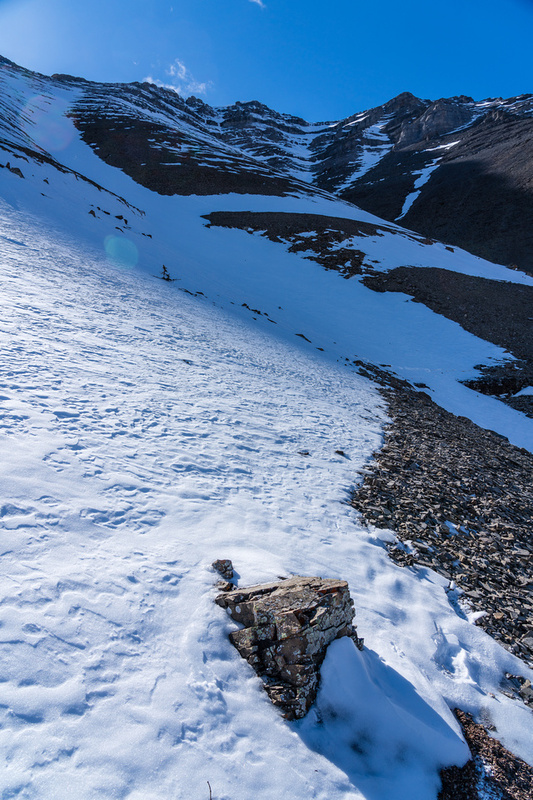 Shivering, we dashed for the summit – secure in the knowledge that somehow we’d found a way to the top once again. 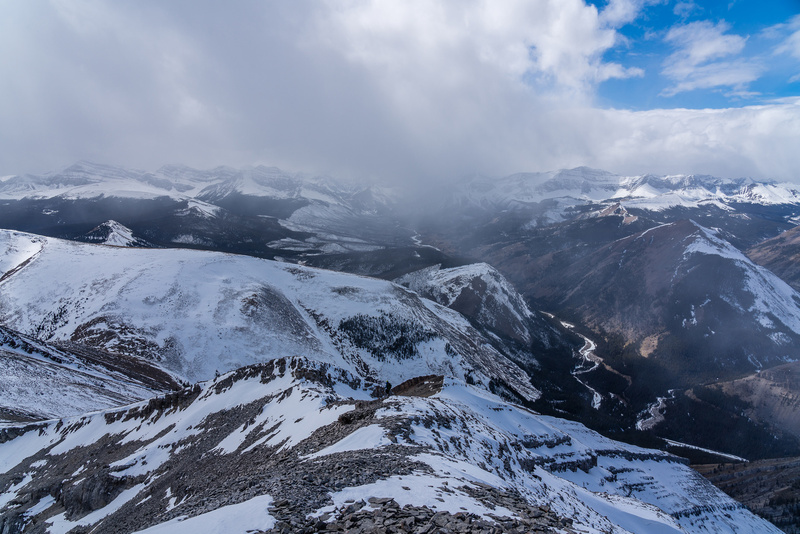 The moody weather made for more great summit views, especially towards Barrier, Panther, Puma and Otuskwan Peak. 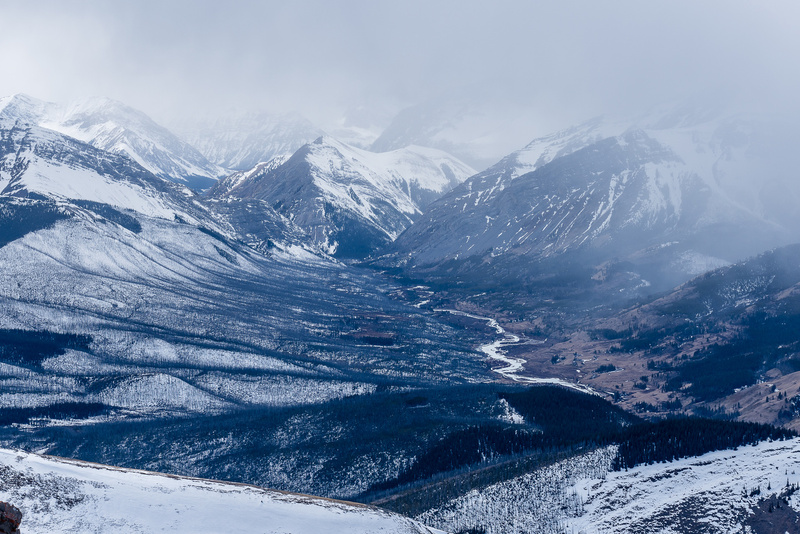 The Panther River valley to the north looked wild with a deep canyon between Barrier and Dormer. 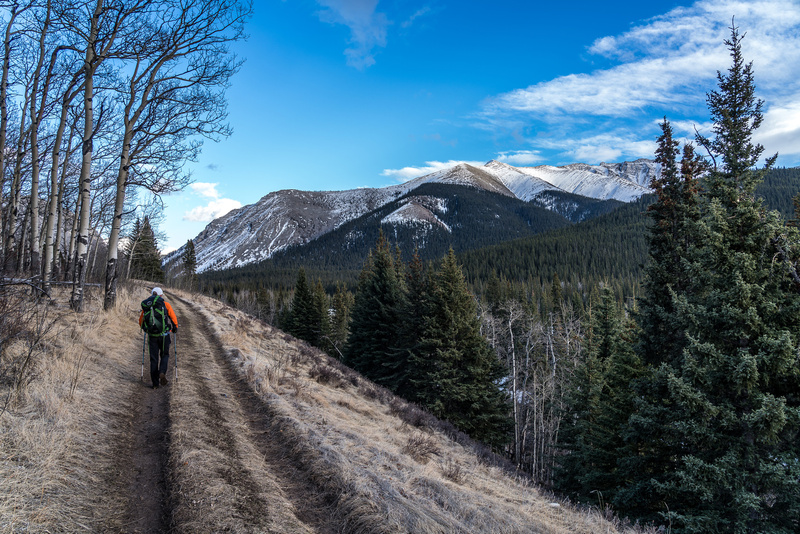 Our first views into the wild and remote upper Panther River valley and the Bison home area. Note the intentional burn on the left which was done to improve the grazing here. Phil ascends the easy SW summit ridge. The summit cairn was strangely huge for a peak that can’t see that many visitors. 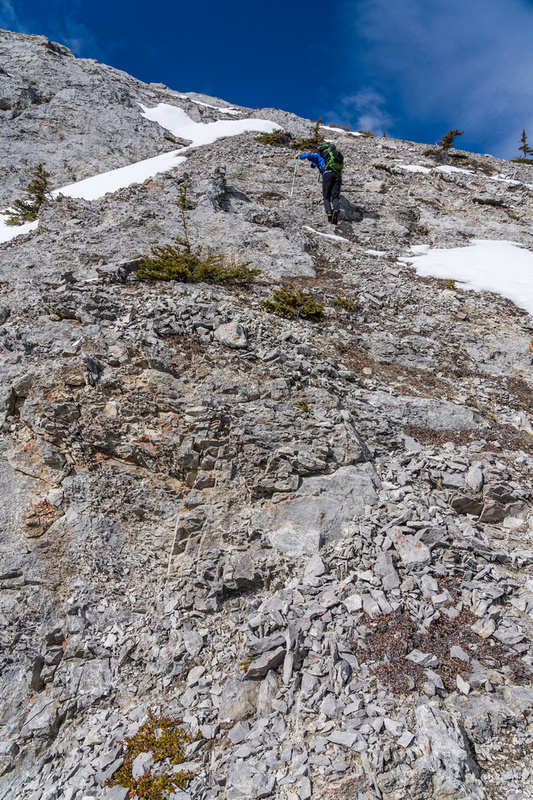 We found zero evidence of any human activity on the entire upper half of the mountain but the cairn was properly massive and devoid of a register as far as we could tell. 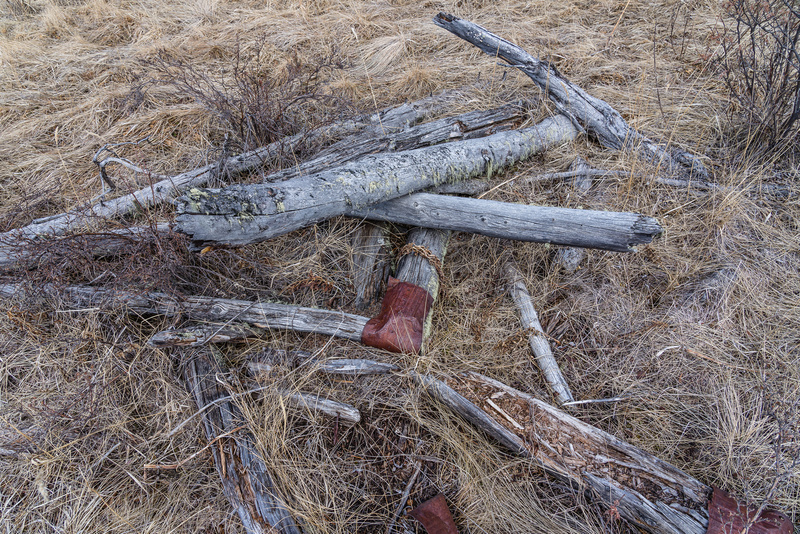 A park boundary marker sat just below the summit. I couldn’t believe it when Phil told me it was already 14:30! View east to Ya Ha Tinda (L) and Winchester / Zombie, Otuskwan, Puma and Panther (R). The “gap” at mid center left. 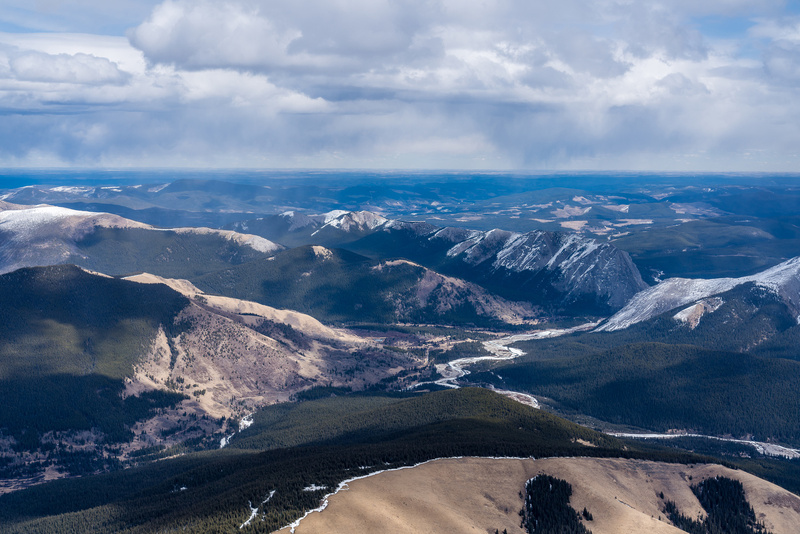 L to R includes Panther, White, Gable, Wapiti, Barrier, Scalp, Hat, Evangeline, Poplar, Eagle, Maze, Labyrinth, Wildhorse, Minos and “Sheep Ridge”. The gap we approached through on far mid right. 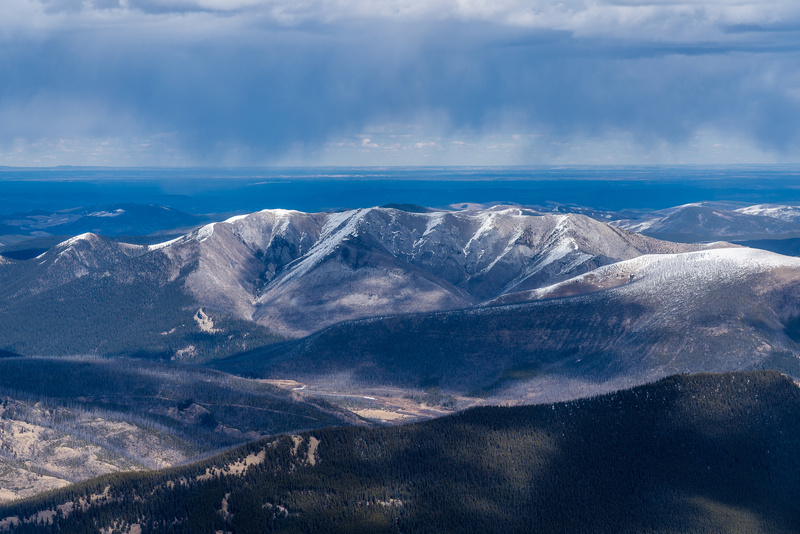 The best views from Dormer include Barrier Mountain to the north across the deep Panther River Valley. 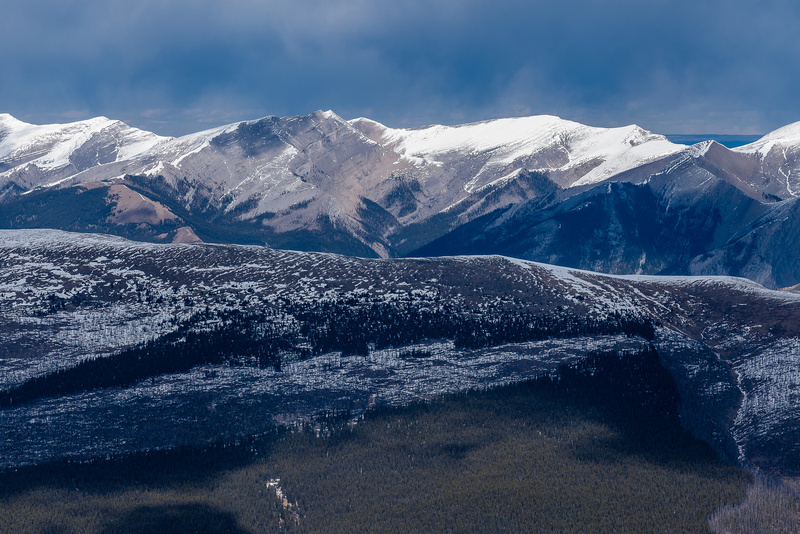 Gable, White and Melanin to its left with the upper Panther River Valley at left containing the Bison’s home area. Panther Mountain just visible at far left here. All the fussing around finding a route to the summit had eaten into our daylight hours big-time and we decided we’d better start the long trek back. Breaking out of the trees with views west up the Dormer River. Otuskwan Peak looks great from this angle. Wild views up the Dormer River. A gorgeous day on the SE ridge of Dormer. Our mountain starts to finally show up! Great views off the lower SE ridge include Dormer at right. 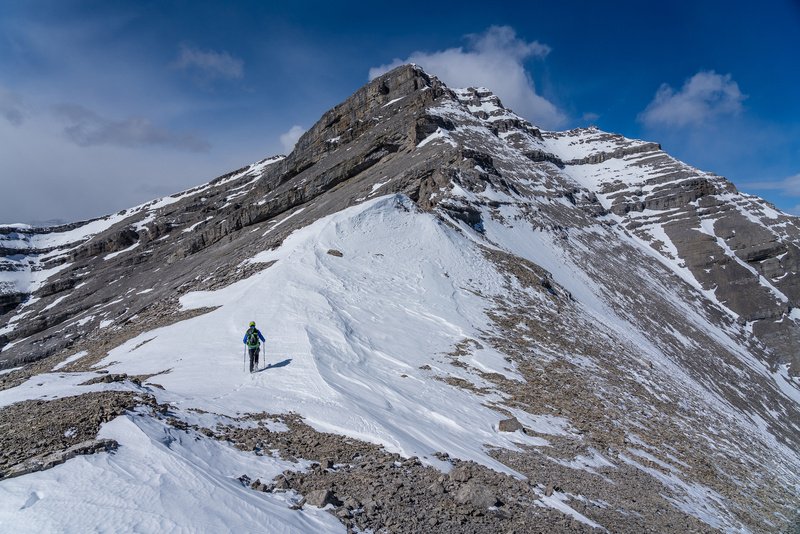 Phil hikes up the SE ridge of Dormer. Views back down the Dormer towards the gap. Above tree line on slabby / pebble slopes. Phil ascends the SE ridge of Dormer. Looking way up to the summit block. Puma Mountain at distant center. We circumvented difficulties on our right (east) side of the ridge. 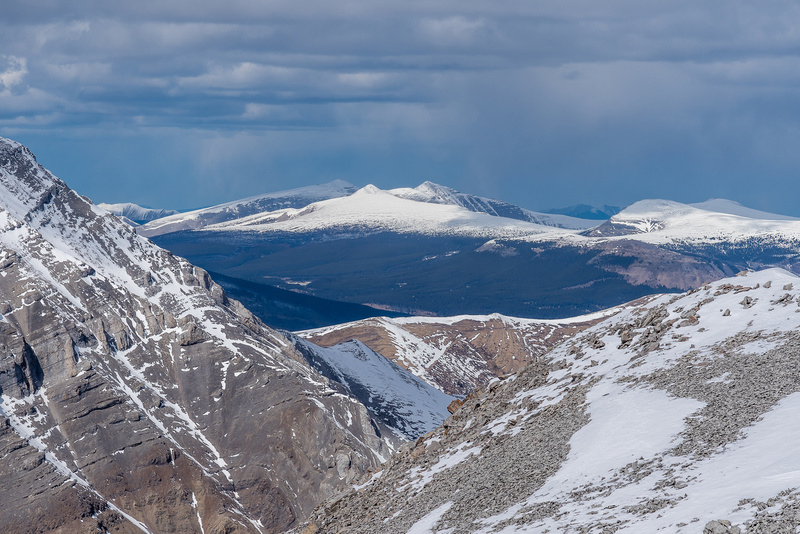 Looking south to Zombie and Otuskwan Peak. 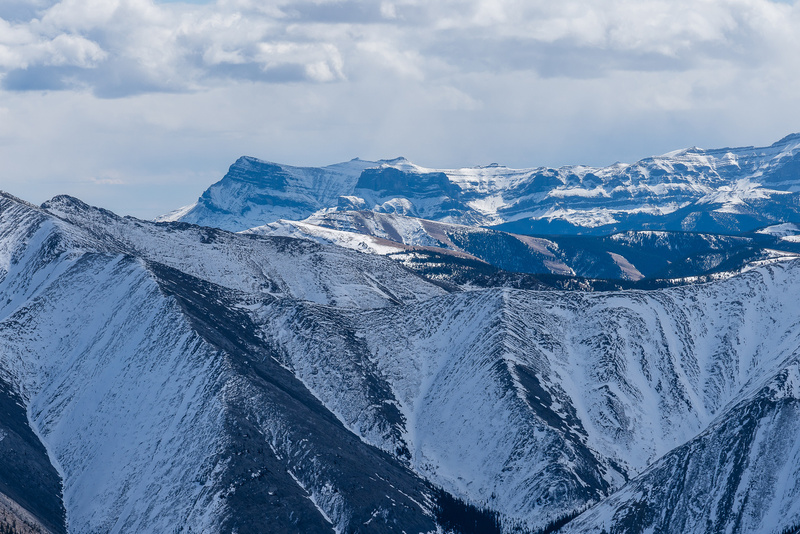 Views south to Kink (Ghost) Peak. Approaching the upper SE ridge. Starting to see lines down to the left. Approaching the upper SE ridge. We will ascend another 100m before cutting down ledges to our left. Scrambling the upper SE ridge. 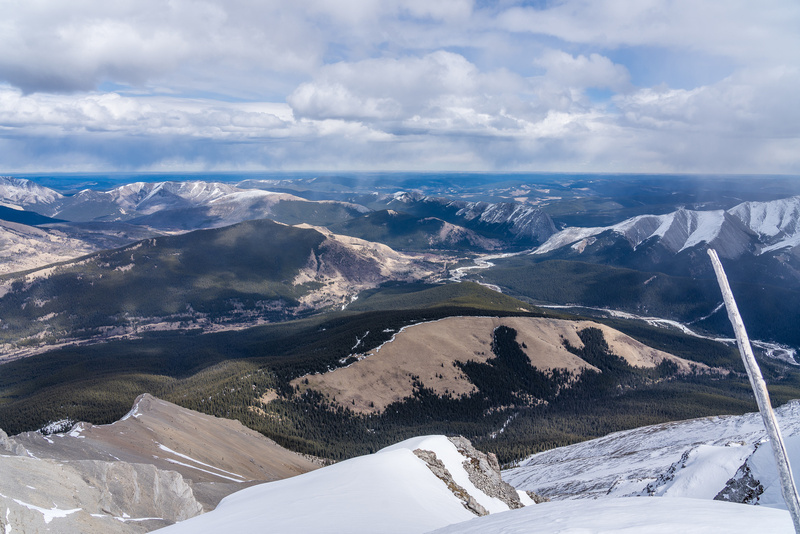 Looking down the SE bowl towards Zombie and Otuskwan Peak. Scrambling along the scree ledge under giant cliffs. Views back over the ledge we descended from the SE ridge. 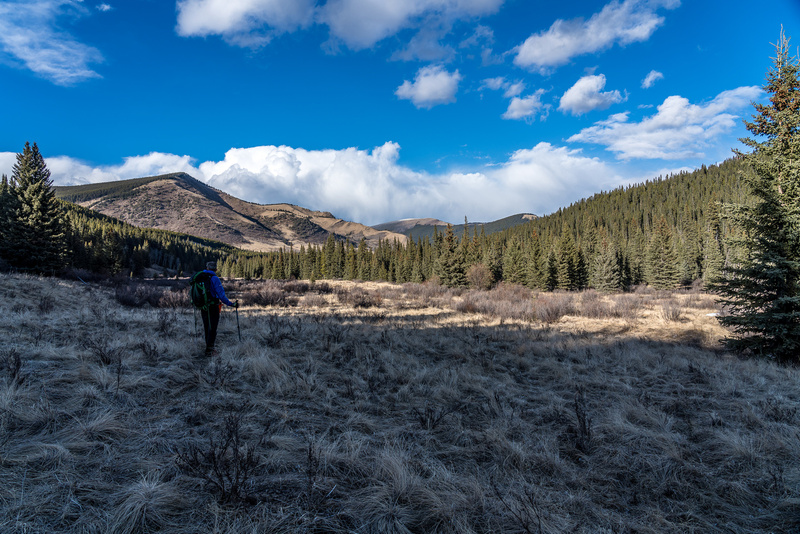 Our first views into the wild and remote upper Panther River valley and the Bison grazing area. View east to Ya Ha Tinda (L) and Winchester / Otuskwan (R). 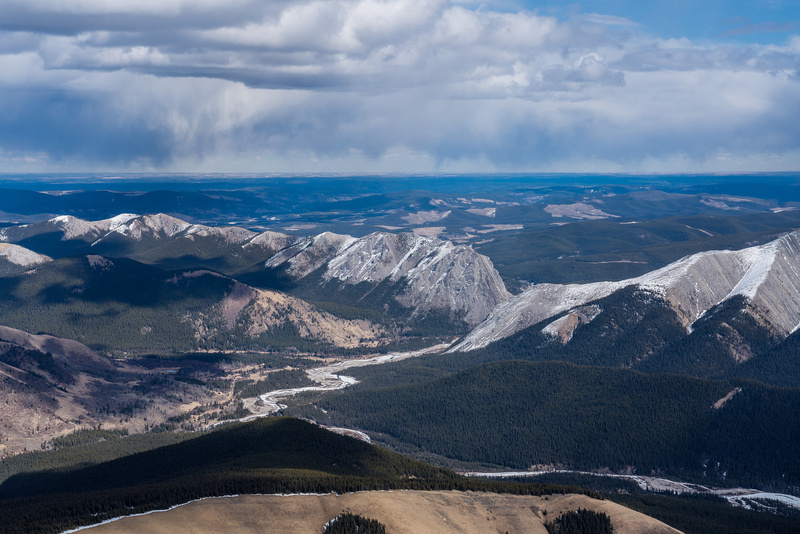 Views north over the Panther River to Barrier, Wapiti, Gable and White. Views east over our access route to the gap and "Sheep Ridge". Labyrinth in front of Maze and Eagle. Wildhorse Ridge with Minos at right. Views over the Panther / Dormer confluence towards the gap at mid right. Mount White at distant left with Gable at center foreground. The weather hides the bison. Mount Oliver lies to the south of Otuskwan. Zombie at center left, Oliver at distant right of center over Otuskwan. 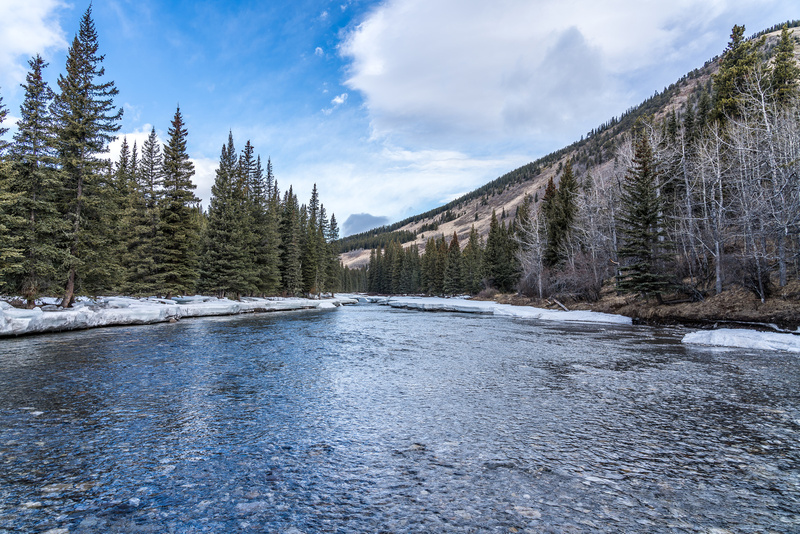 The Panther River cuts through some gorgeous backcountry. 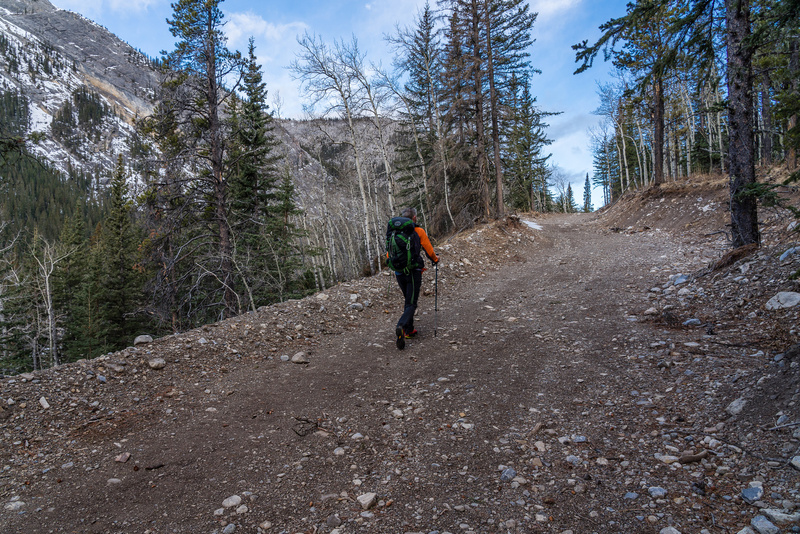 Barrier Mountain's south end is an impressive series of cliffs down to the Panther River. Taking a break out of the wind with wild scenes in front of us. Panther Mountain's distinctive shape. It forms the south end of the Bare Range. Time to get back onto (and then up!) 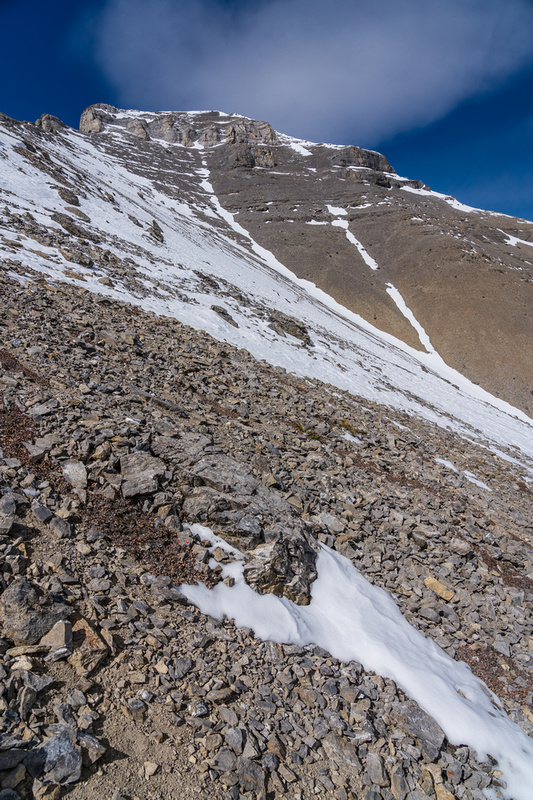 our scree ledge to the SE ridge. Scrambling down to the ledge. Looking up the ledge along the cliffs to the SE ridge. Getting through cliffs and slabs to access our ledge. Reascending the ledge to the SE ridge. 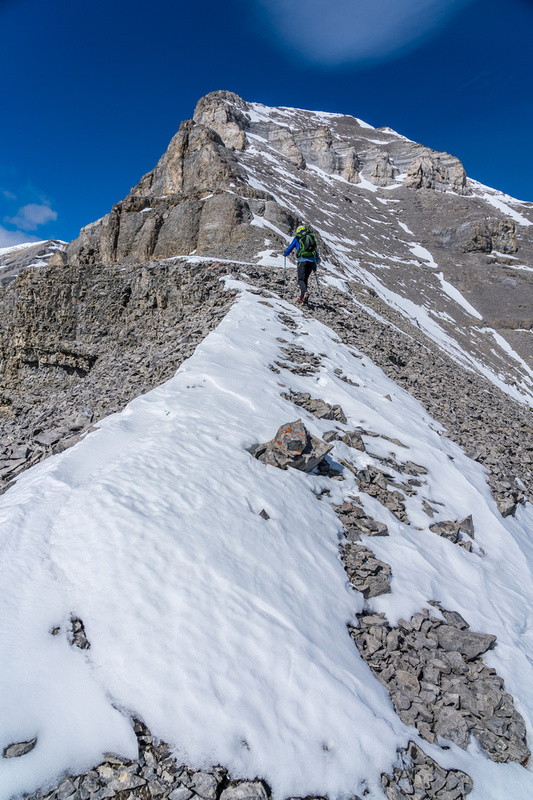 We retraced our steps down the SW summit ridge before cutting back down towards the SE bowl and then back up the scree traverse along the cliffs to the SE ascent ridge. 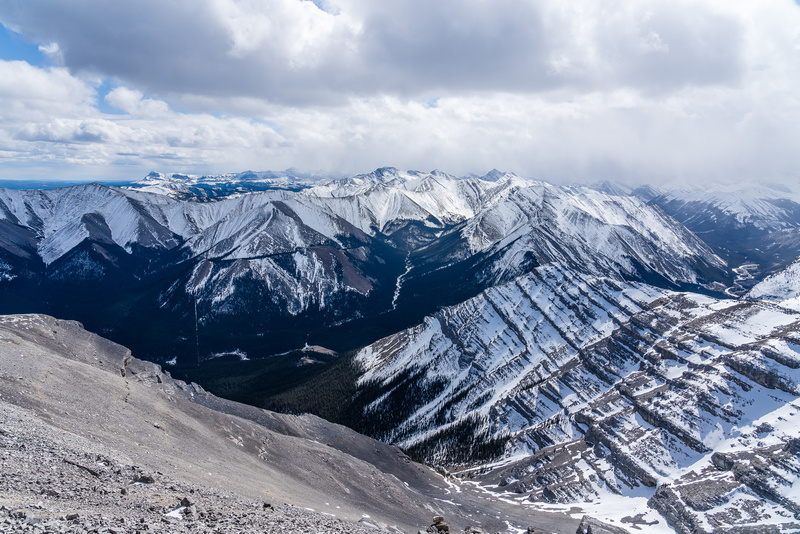 From high on the SE ridge, the east face looked surprisingly reasonable as a descent option. If you know me, you know that I avoid unknown alternate descents if at all possible. They never turn out as easy or simple as you think. 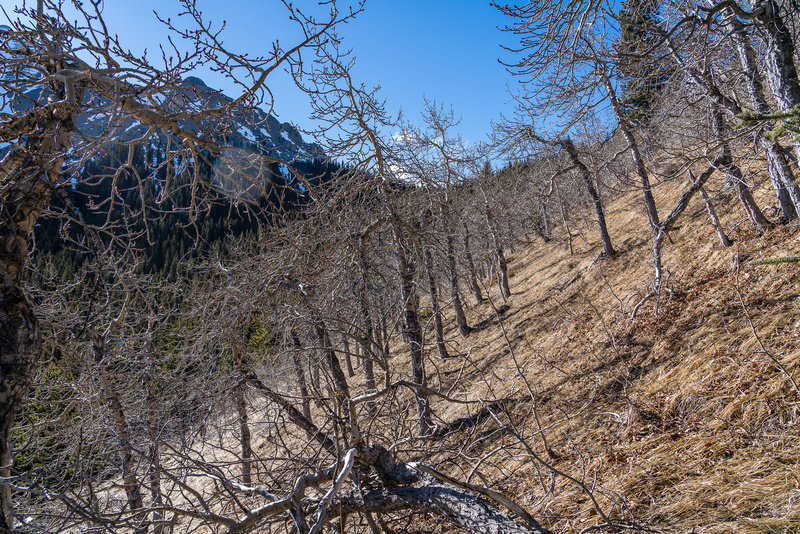 I must have been tired because in this case I thought it was a no-brainer, in part because it gave us access to a grassy ridge just east of Dormer Mountain that we wanted to explore on exit. Back on top of the east face which looks pretty tame in this view. Looking over the grassy ridge we’re trying to get to and the confluence and gap in the distance beyond. Winchester Ridge at right. The upper east face was pretty easy. 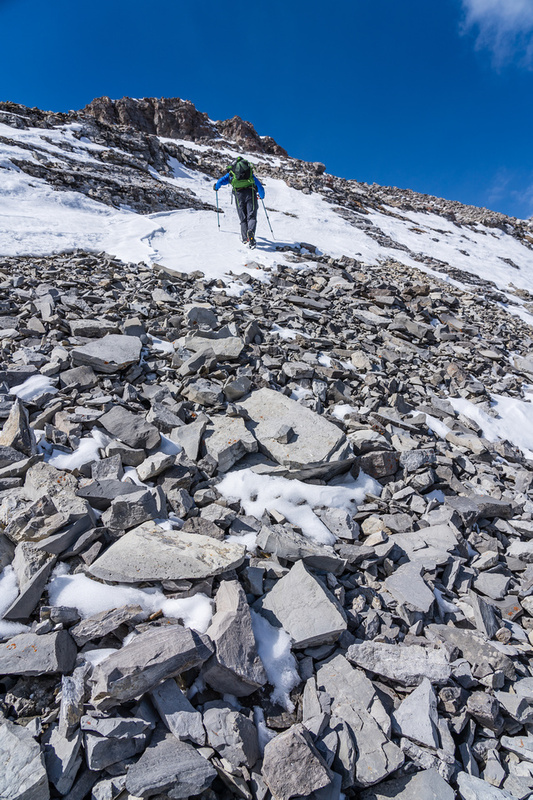 We descended a mix of snow / rock / slabs until plunge-stepping down a steep snow patch on the edge of a shallow gully. 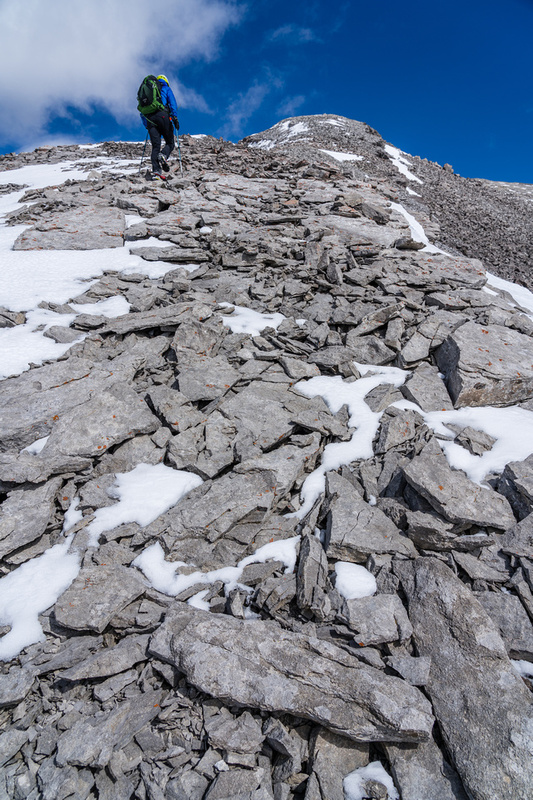 This was harder than expected due to an icy crust that cut into our legs when we broke through it but was still preferable to the hard scree. As we descended I started noticing huge cliffs beneath us on each side. Typical. We cautiously moved downward until we found ourselves thoroughly blocked by cliffs with too much snow on either side to traverse safely. 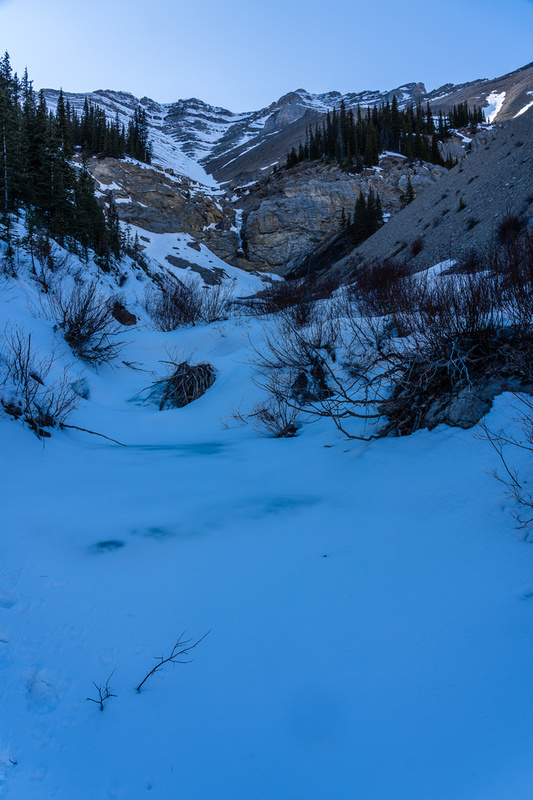 A treed rib with waist deep snow showed up just in time and we used crampons to traverse off the rib to our right to finally escape the cliffs. 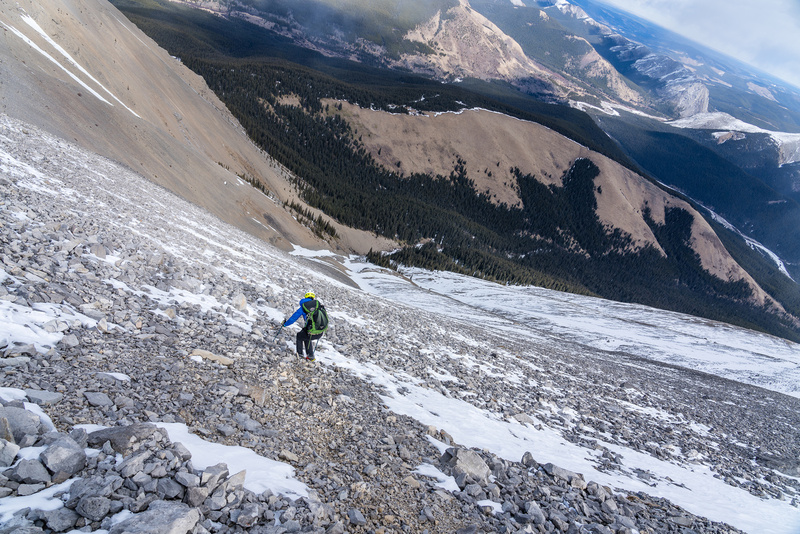 Nearing the bottom of the east face we start noticing cliffs below… This won’t be as easy as we first thought. Using crampons to traverse an avy gully and finally escape the cliffs in steeply treed terrain where we found the bear den. The east face looks kinda inhospitable from the drainage. Discovering the den was the perfect way to cap our day of explor8ion. 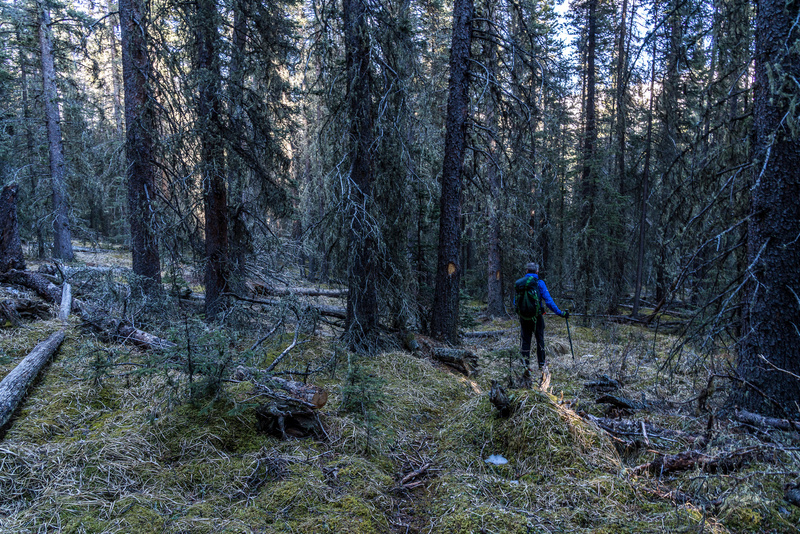 We’d been following numerous bear tracks all day and now we’d likely stumbled on one of their dens. Given how hidden it was and where it was, the odds of this happening were infinitesimal and yet it happened. A somewhat normal day of adventure was becoming more and more special with each passing hour. 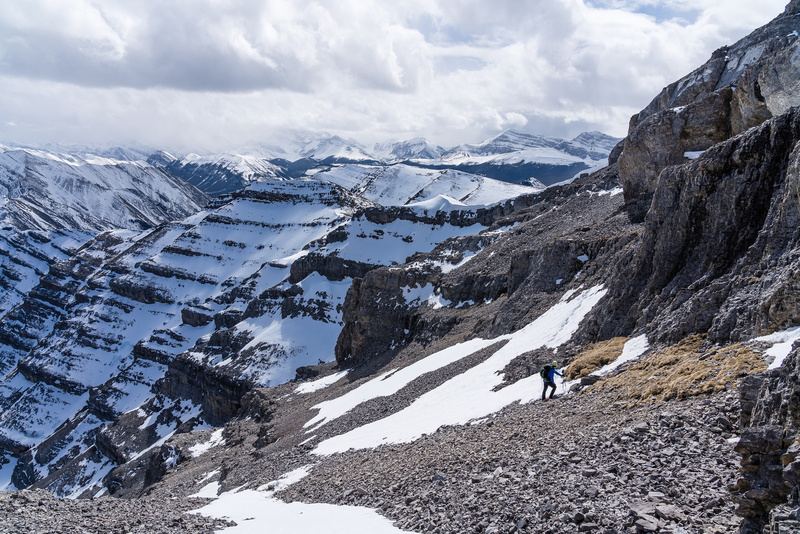 We finally stumbled our way off the snowy east aspect of Dormer and started our hike up the open grassy ridge we wanted to use for descent. Looking back on it I can’t recommend the east face as a descent or ascent route. 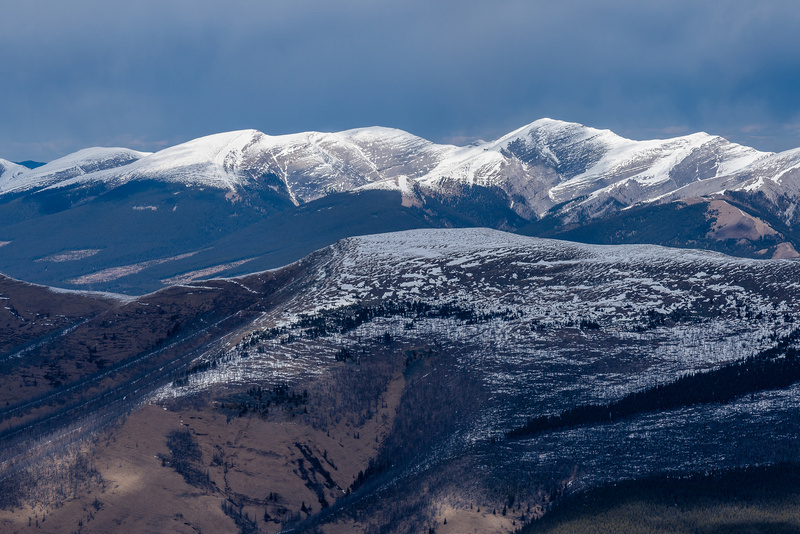 The SE or S/SW ridges are much better and safer, especially with snow. 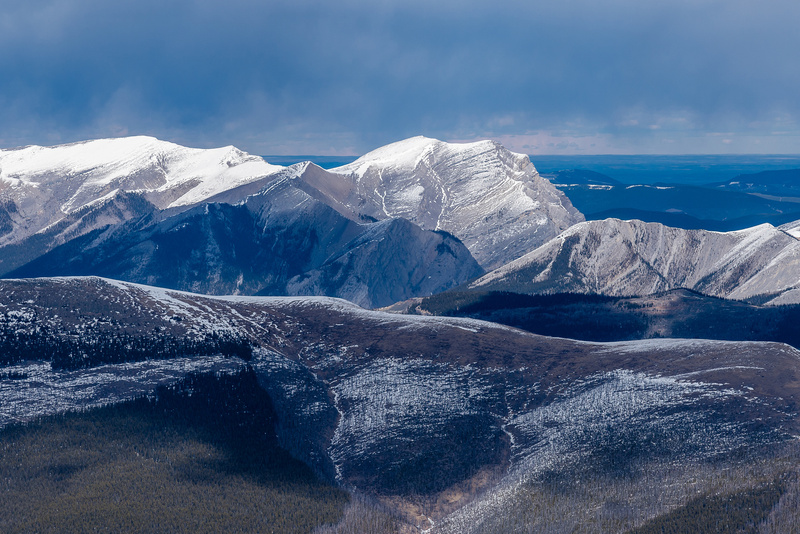 Great pano from the grassy ridge showing Winchester, Otuskwan and Dormer Mountain (R). The ridge was ascended at skyline trending up from mid photo and the east face descent route looking pretty snowy and steep. 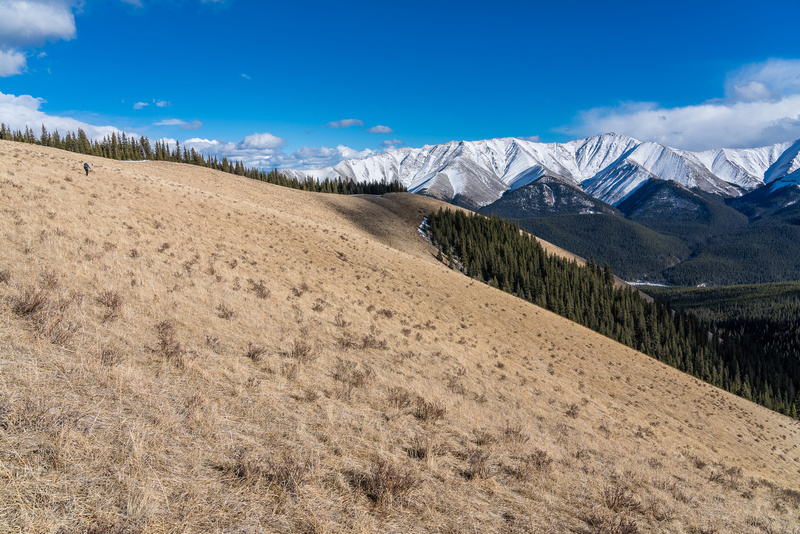 In a theme for the day, we found ourselves once again ascending as we worked up to the grassy ridge from the east face drainage. It wasn’t a huge elevation gain but we were now over 10 hours into our day and starting to feel it. 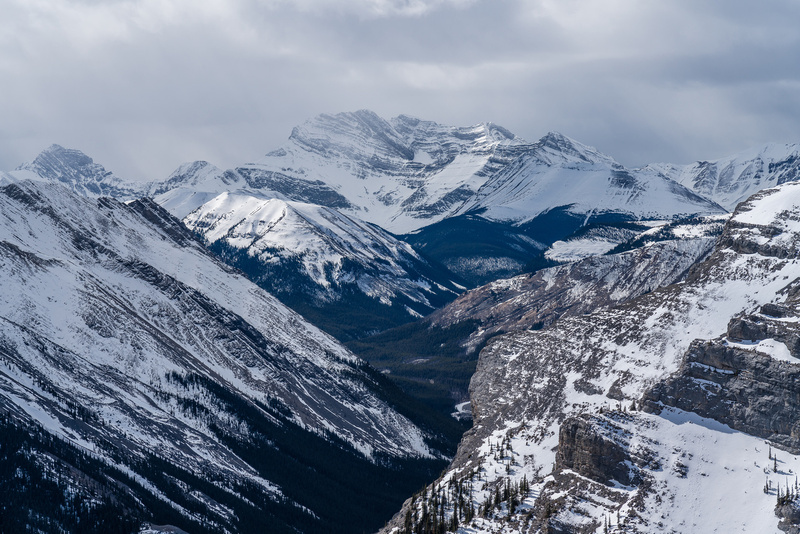 In another theme, the views kept us going and eventually we were on the ridge crest and officially starting our descent back towards the Dormer River. 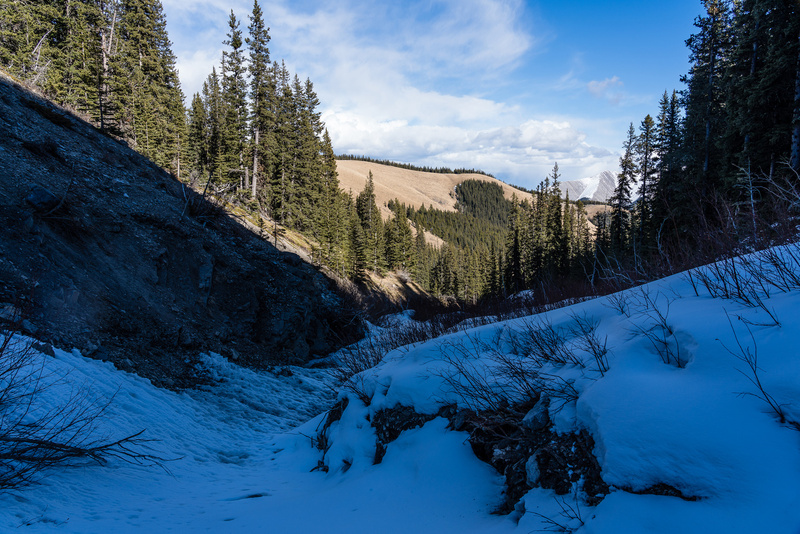 Despite a chilly west wind, the hiking was sublime and was definitely worth the suffering to experience it. Wouldn’t you know our luck? 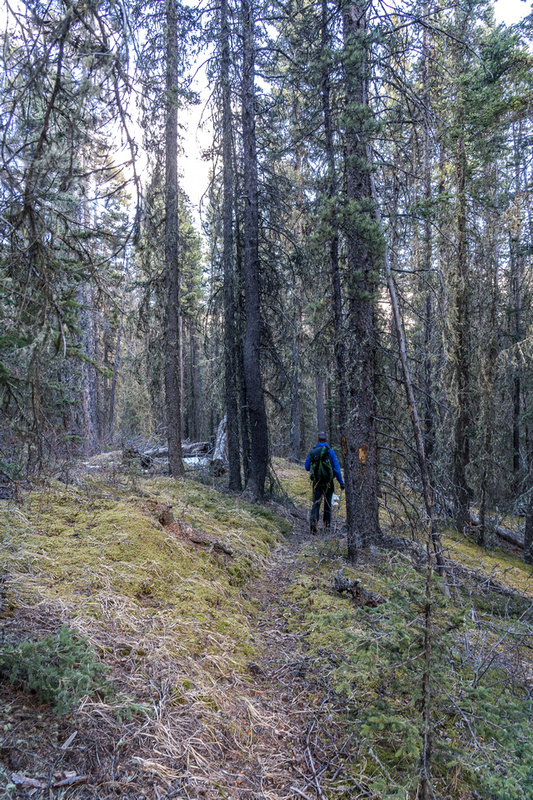 We managed to find a blazed trail down the south nose of the ridge, eventually ending up on a very old, overgrown road. On a faint trail in light forest. 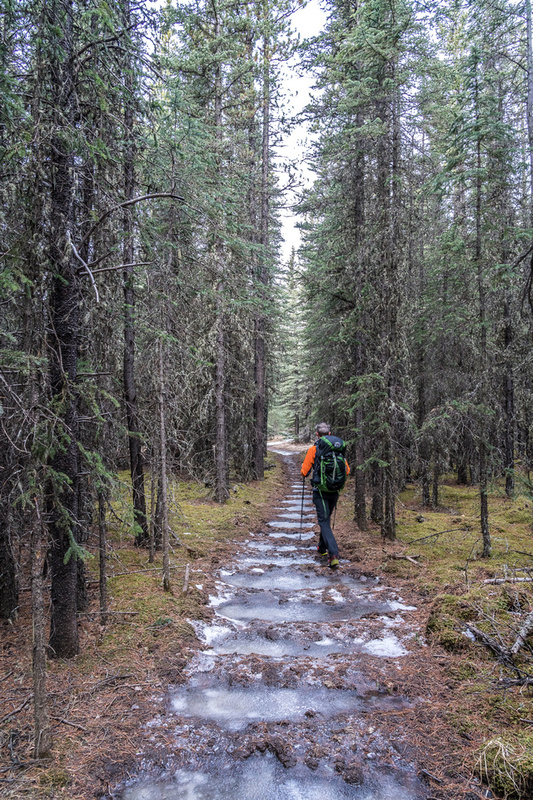 We stumble onto an old exploration road leading down the Dormer River trail. 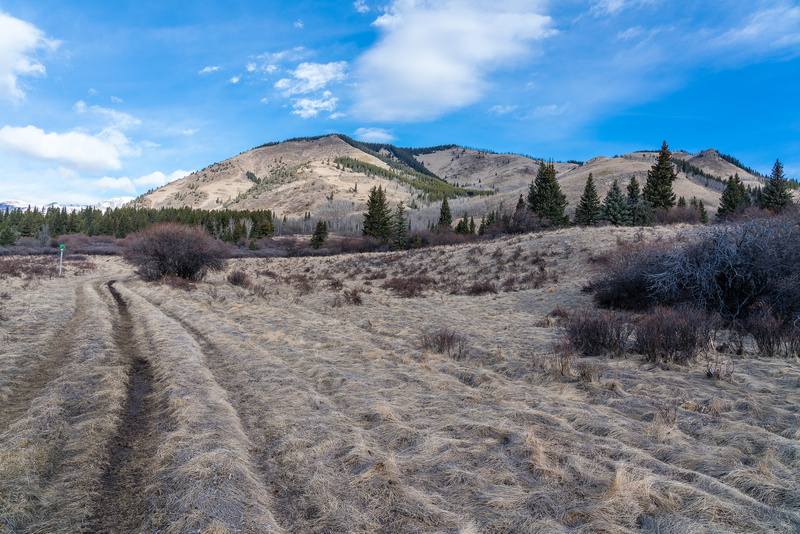 The old road led down to the Dormer River trail and our route back to the Panther River. By this time in the day (it was around 18:30) the trail was melted out and quite mucky in spots. 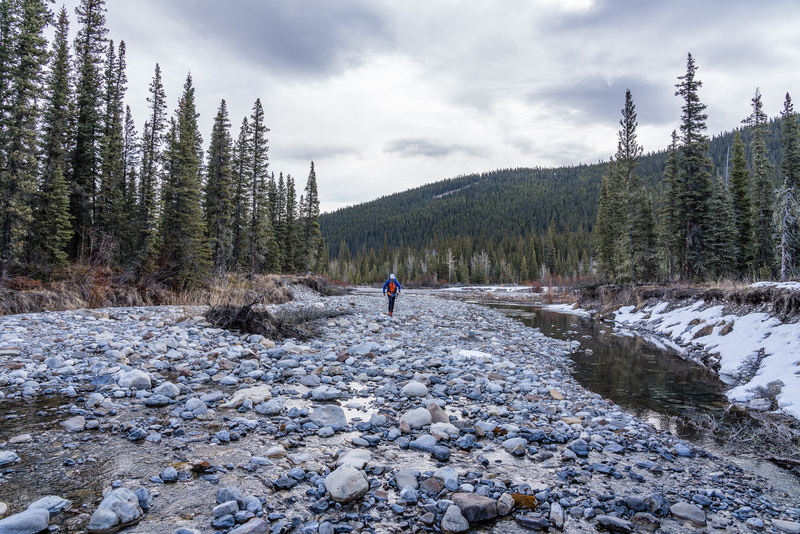 Thankfully there were no more fresh grizzly tracks and we maintained a pretty quick pace all the way back to the Panther River and our wading gear. Crossing the Panther River just upstream of its confluence with the Dormer River. The rest of the day was a mix of pleasant evening hiking and trekking along muddy tracks and through slushy snow back to our bikes. It was a lovely Spring evening with birds and sounds of nature providing the melody for our quiet reflections on the day we’d just experienced. As darkness once again embraced us we donned headlamps and kept marching on – our thoughts turning inward with the fading light. 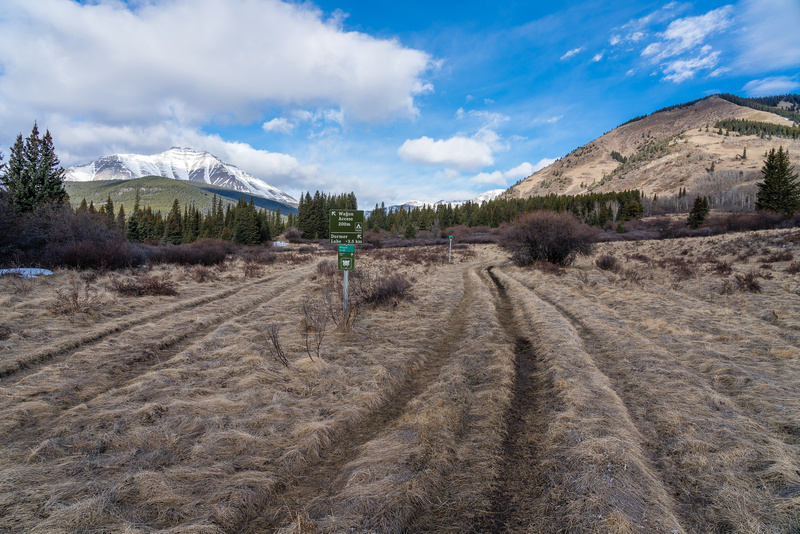 The Panther River wagon trail and Mount Dormer. 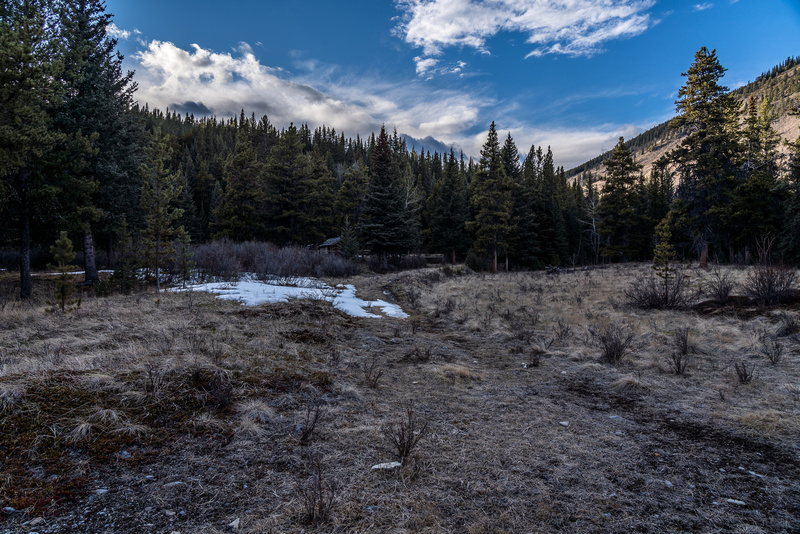 The Panther River and Barrier Mountain from the gap as some wild weather moves in and the light starts fading rapidly. An hour later and it was pitch dark. The short bike ride to the final crossing of the Panther River was unexpectedly pleasant and fast despite the darkness. Roughly 14.5 hours after leaving the truck we were back. I’ve written this before but it was reinforced once again on this trip. Views over the grassy ridge to the confluence and the gap. The east face is pretty easy near the top. This gives a better idea of the steepness on the east face. It looks so easy to get to that grassy ridge! It's not. Looking back up the east face. Cliffs are blocking a direct descent to the drainage below. Some glissading to avoid waist deep snow. Another cliff block easy descent. We traversed right. 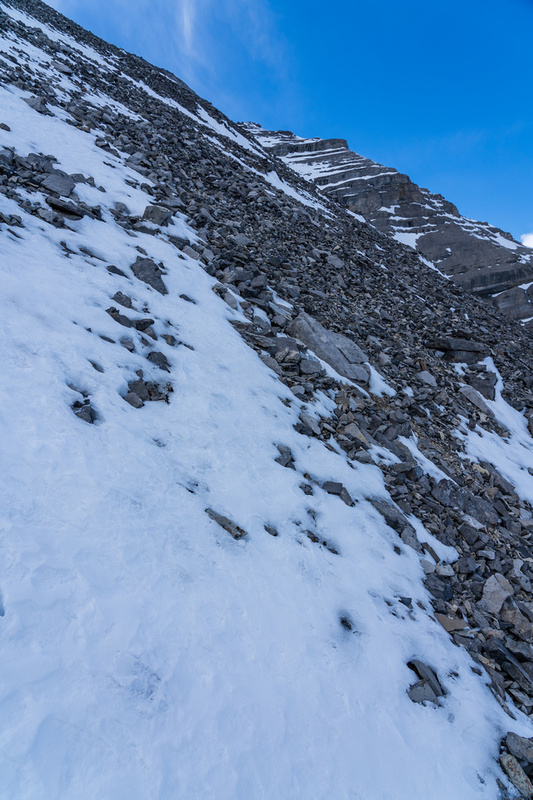 Using crampons to traverse an avy gully and escape the cliffs. Almost home free, just have to traverse left to get onto the grassy ridge. Finally off snow, looking back at the east face of Dormer. Hiking up the grassy ridge. Winchester Ridge in the distance here. 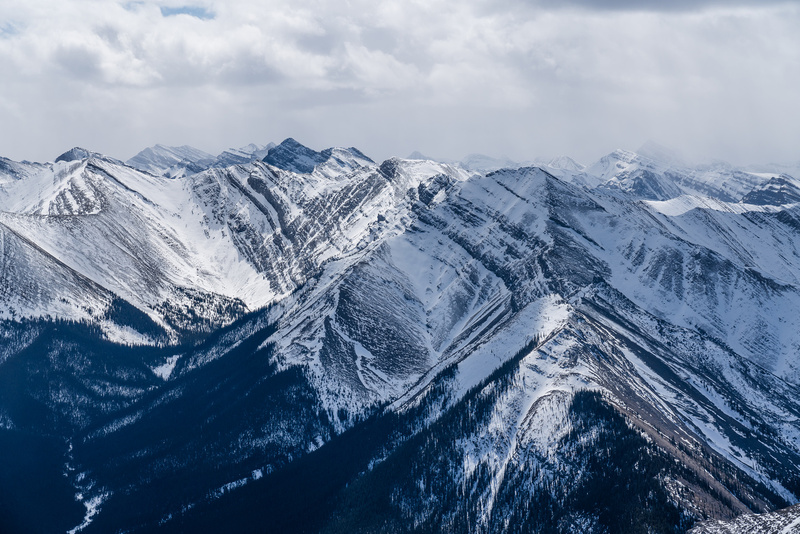 Great pano from the grassy ridge showing Winchester, Otuskwan and Dormer Mountain (R). Pleasant hiking down the grassy ridge towards the Dormer River. Back at the Dormer River! Hiking back along the Dormer River. 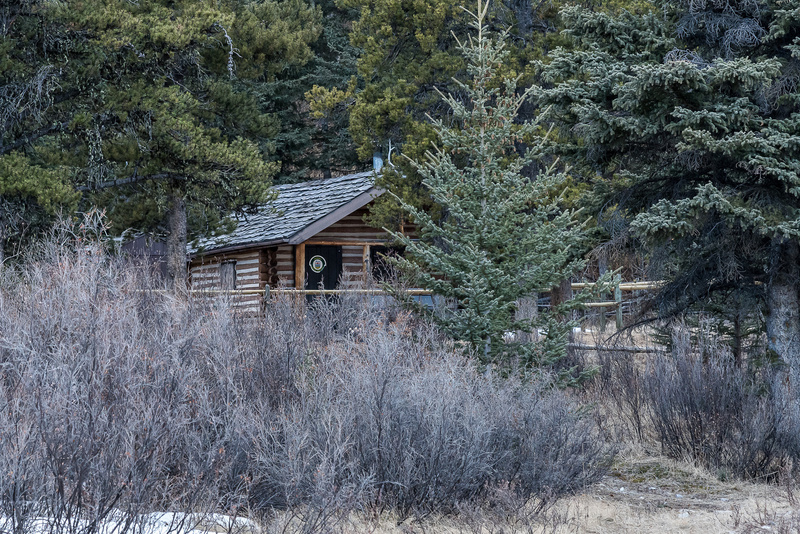 A cabin at the confluence of the Panther and Dormer Rivers. 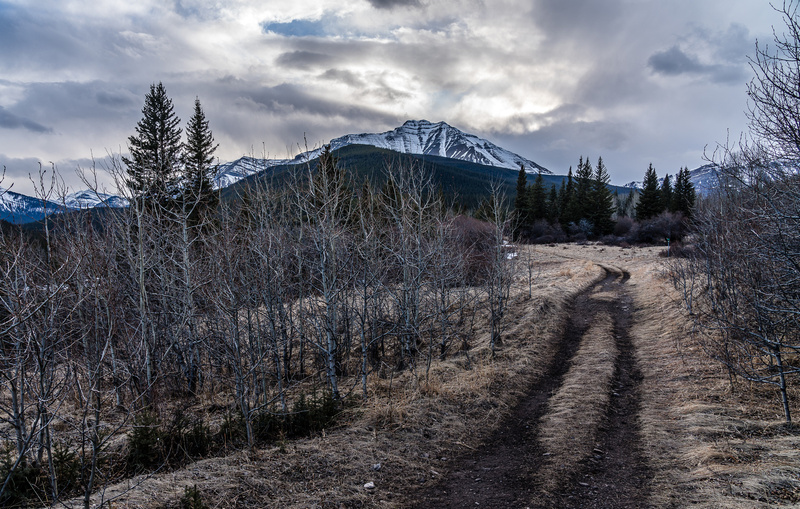 Early evening hiking along the Panther River wagon trail. 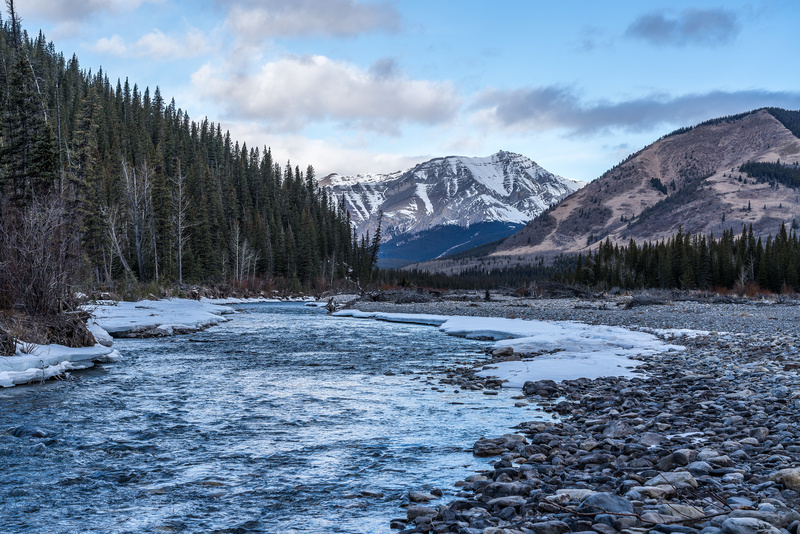 The Panther River and Barrier Mountain. Phil crosses the Panther River at "the gap". 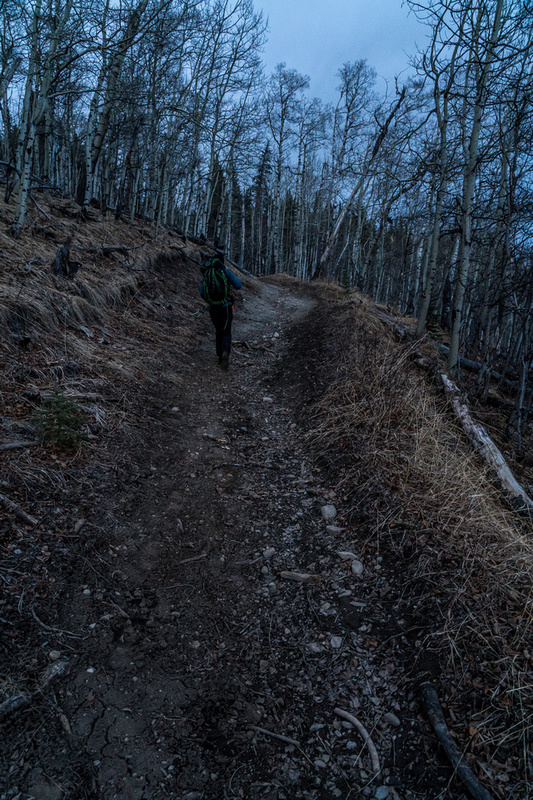 Darkness settles in as we navigate the wagon / horse trails back to the Panther Road. Long day trips have their issues but IMHO any issues are outweighed by the depth and breadth of experience they offer. 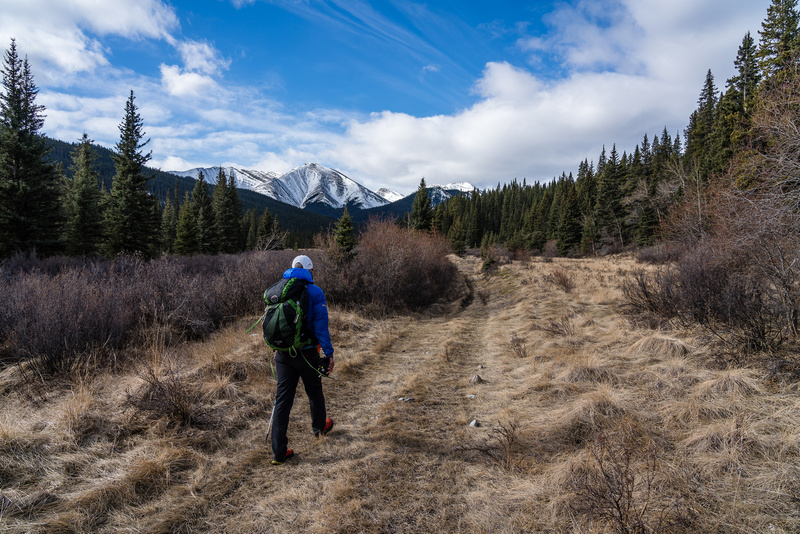 Moving through 37 kilometers of backcountry that’s new to us provided us with such an overload of sensory input that it’s almost overwhelming when I meditate on it. Hiking new trails, crossing wild rivers, walking in the footsteps of grizzlies, wolves and horses, finding unknown routes up an unknown mountain, stumbling on a grizzly den and then reversing it all in one day is truly what I live for. Doing it all while not having even a hint of a successful summit until the very last minute makes it even more special. The odds of discovering a grizzly den, tells about the potential numbers of them in the larger areas . A spooky area to be in , for sure. Well, I don’t consider bears “spooky” but yeah, where there’s less humans, there’s more bears I suppose. Fantastic work guys! Always stoked to read your reports.